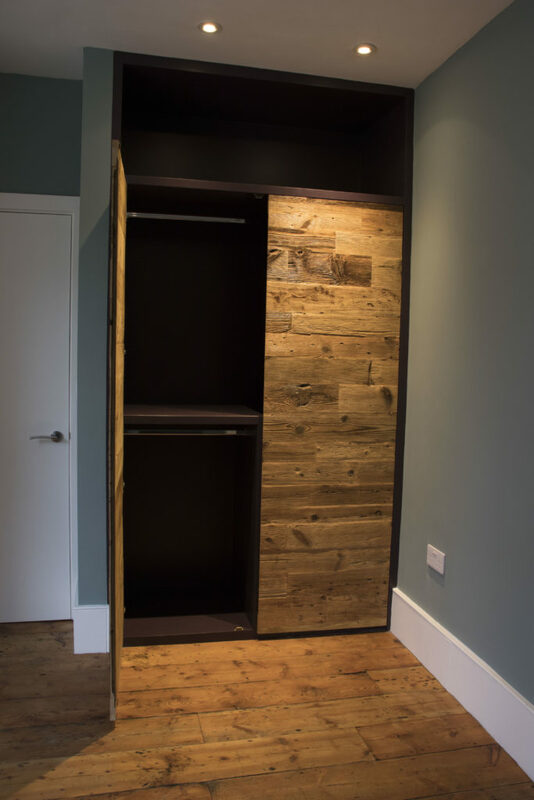 Brandler London wardrobes are all unique pieces, and we truly enjoy the designing and fitting, using the highest quality materials and installing to exacting standards. 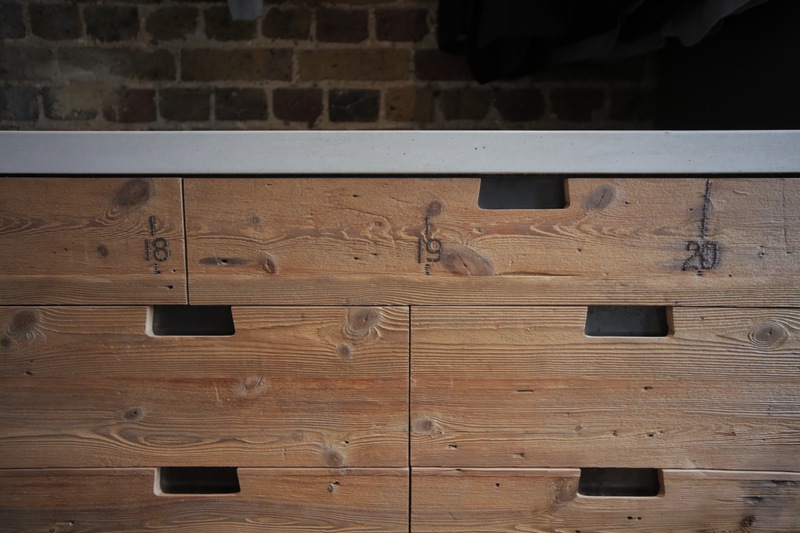 All of our wardrobes are handmade by our team of master craftsmen in our London workshop. 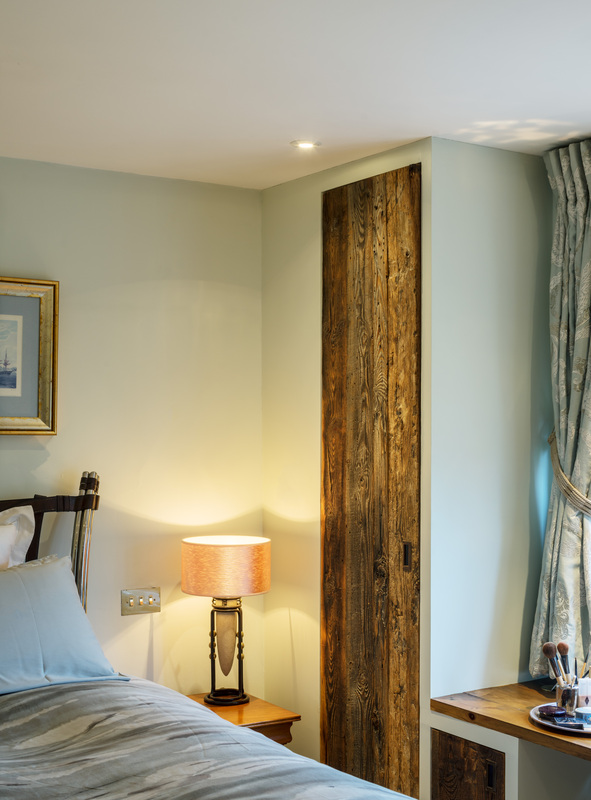 We can create any type, from small sliding wardrobes to large walk-in wardrobes. 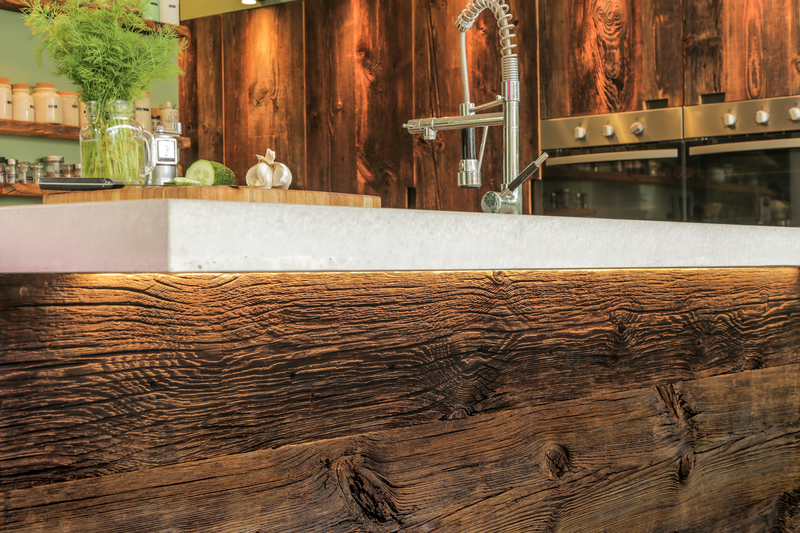 Our supplies of reclaimed wood allow you a choice of pine, oak, or larch depending on the look you want. 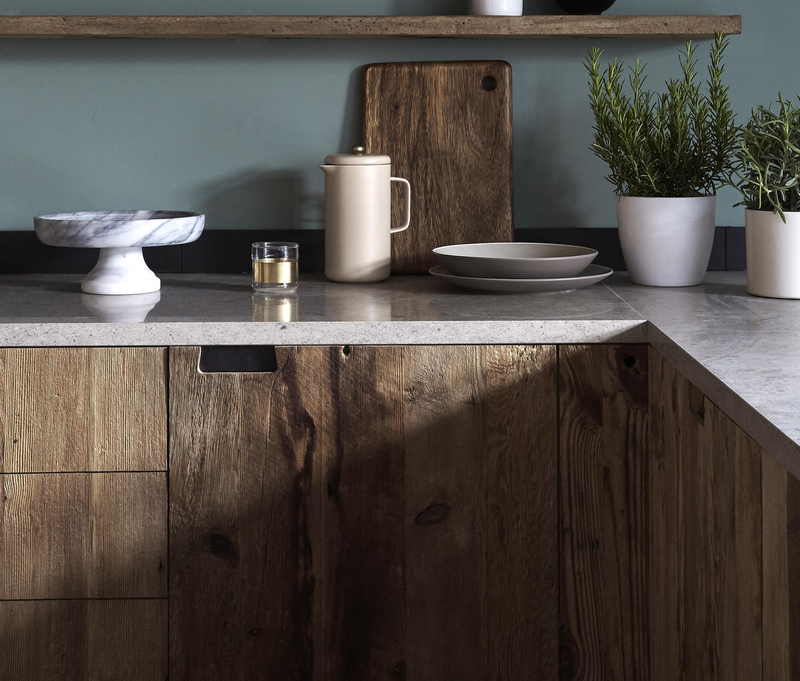 From overly weathered, dark and almost burnt in appearance, to perfectly preserved, smooth and light coloured finishes, we can supply the tone and texture you’re looking for in your bespoke wardrobe. 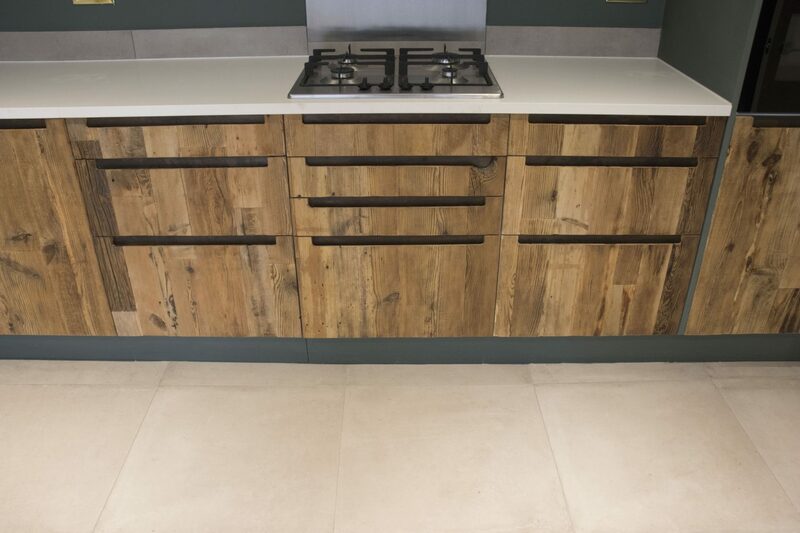 There are a range of additional finishes we can apply onto these wood types, depending on how you want to use the pieces. 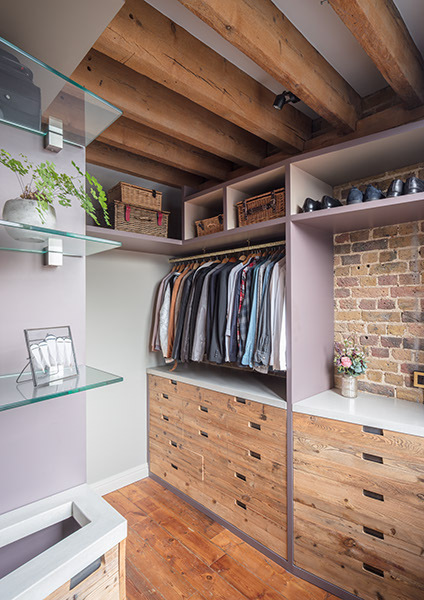 If the Brandler London style is for you, then please get in touch and our team will work with you to create your wardrobe specifically to your requirements. 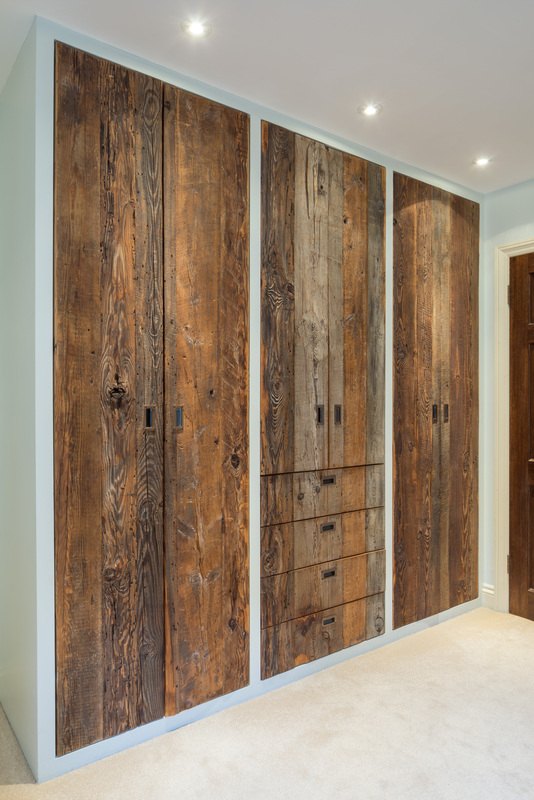 As it is all handmade and every piece of wood has its own character, there will never be another set of wardrobes quite like yours. 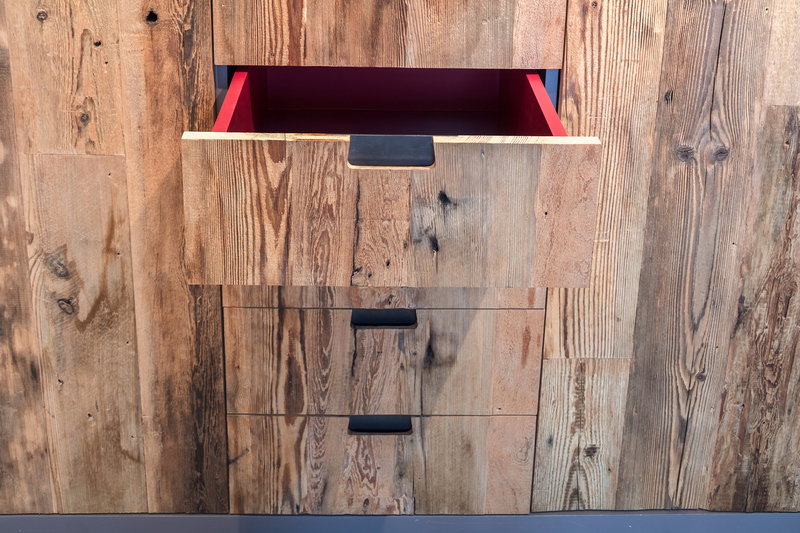 They will be unique to your aesthetic and storage needs. 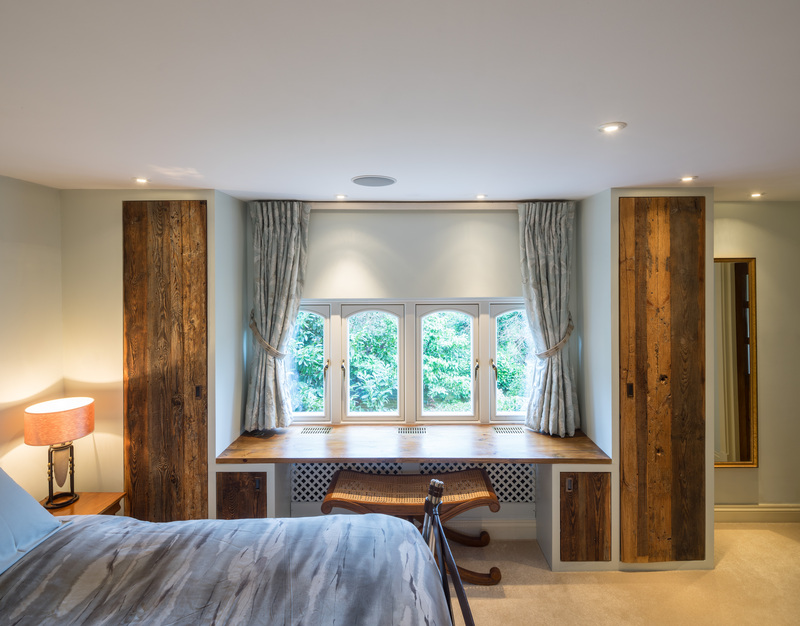 This project was a complete bedroom revamp, with reclaimed pine wardrobes salvaged from a sheep farmer’s derelict barn. 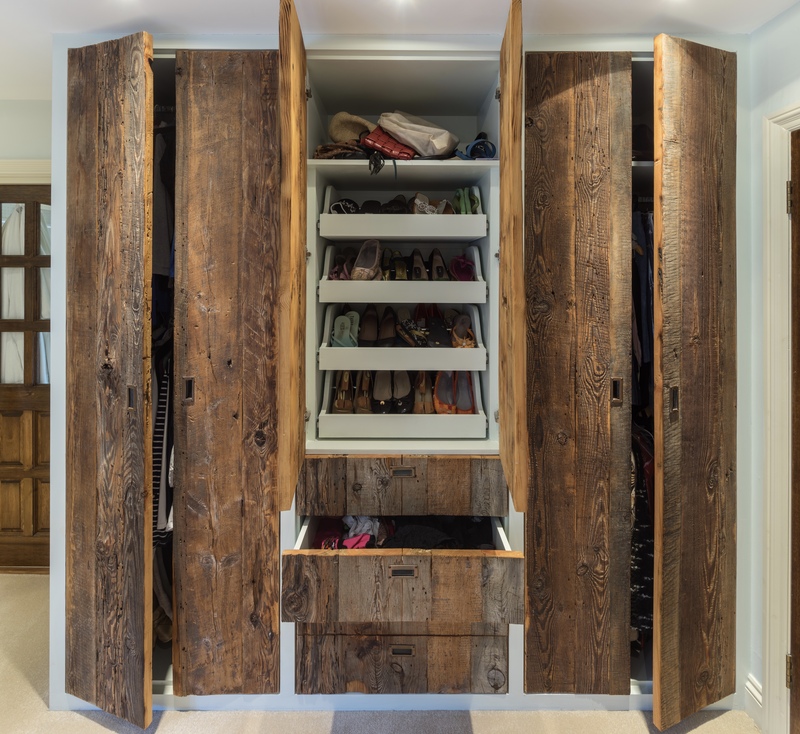 The main tall wardrobes are fitted out with central sliding shoe rack, with plenty of hanging rail space, and integrated drawers. 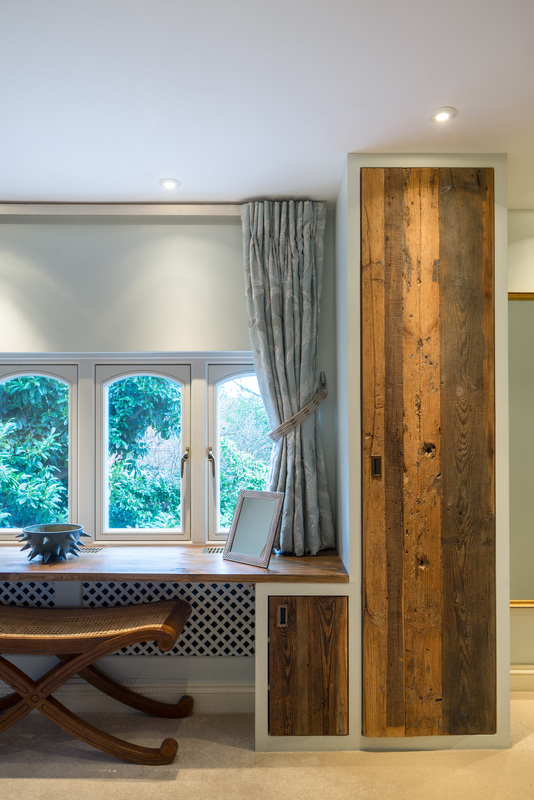 The wardrobes on either side of the vanity frame the garden view providing supplemental storage. 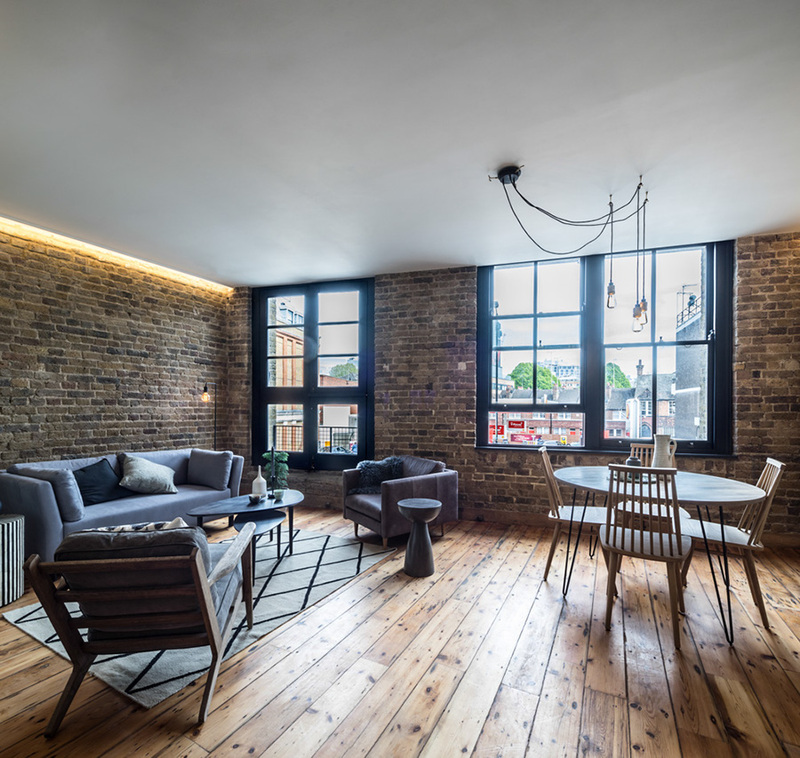 The space was re-wired with retrofit lighting and a discreet built-in sound system. 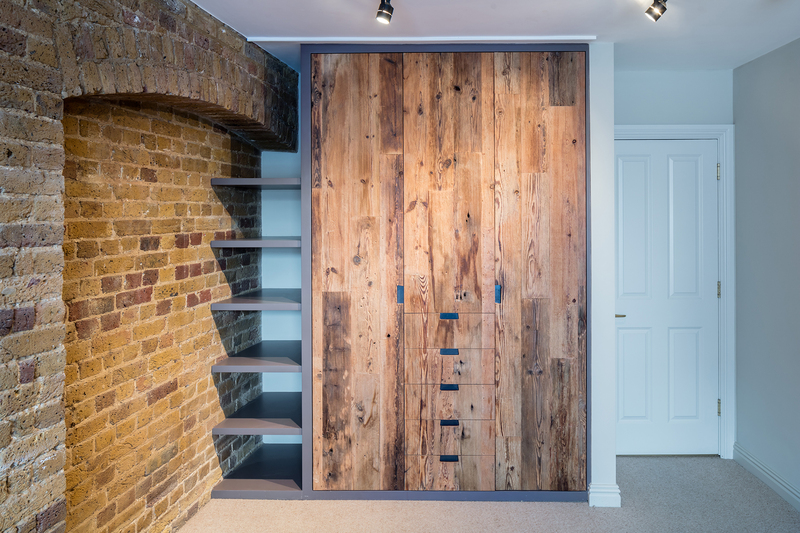 These wardrobes bristle with all of the original character of the converted warehouse in which this project is located. 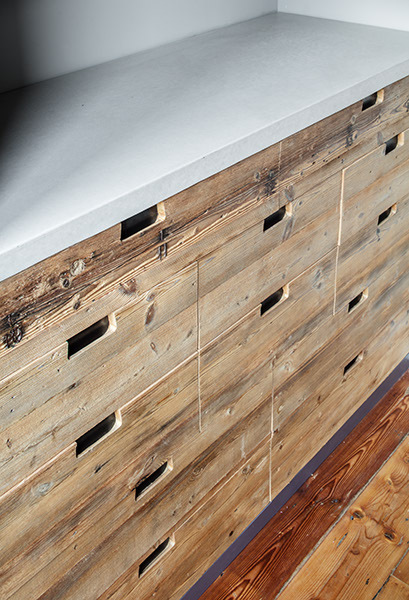 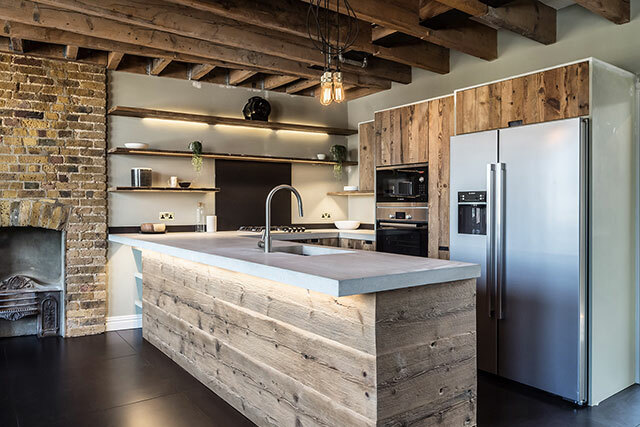 The reclaimed wood used here is embedded with numerated rusted nails that were part of a foot long measurement system, revealing a glimpse of the inner workings of a warehouse built in the hops processing era. 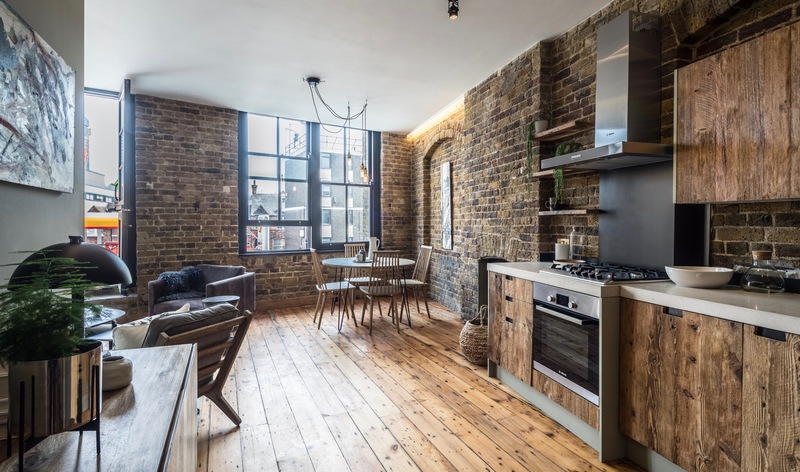 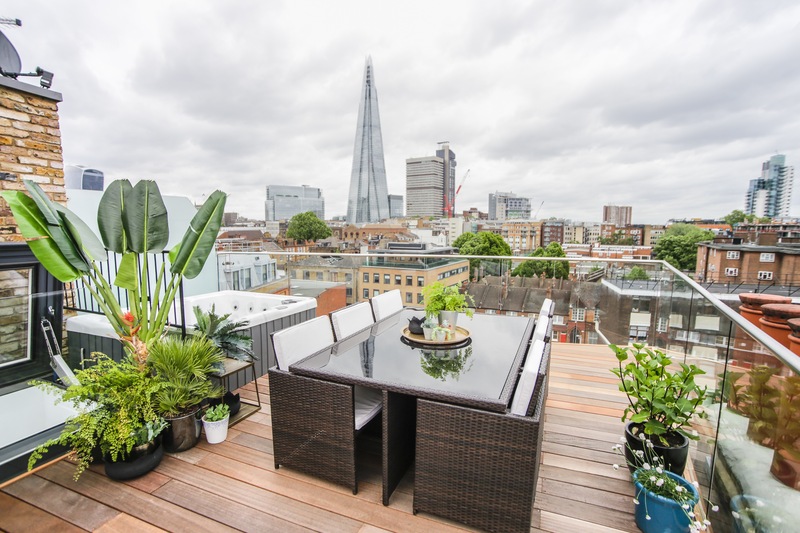 *Disclaimer – Property dressed by Brandler London and as such expressly does not reflect the interior design style of the owner. 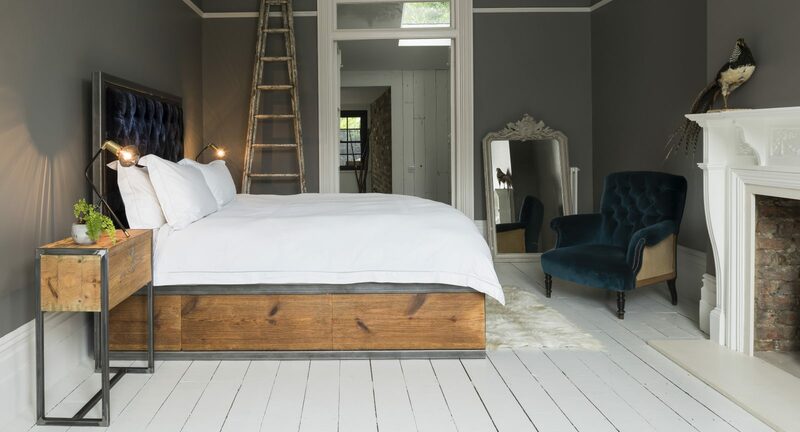 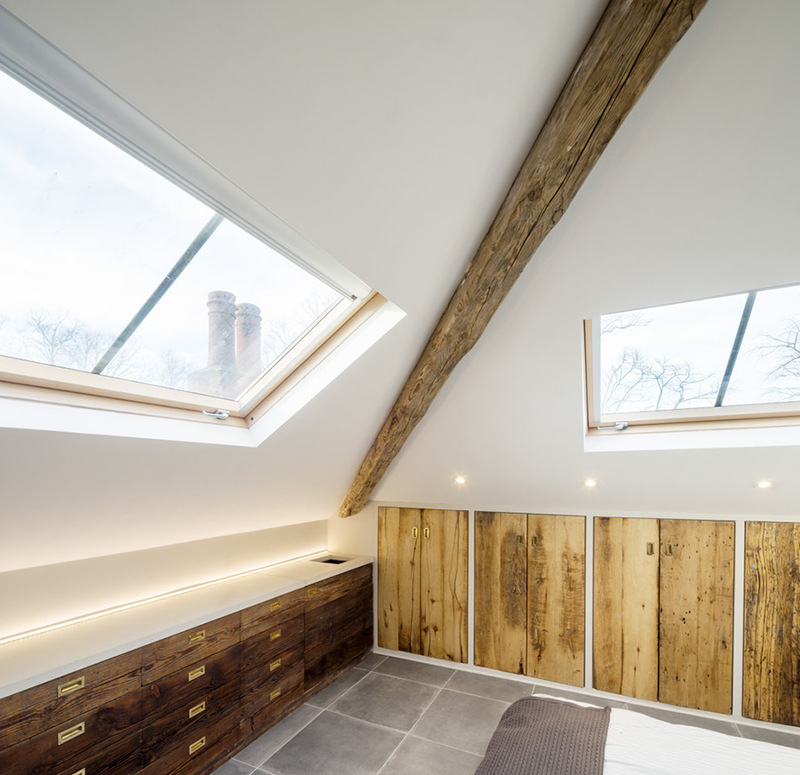 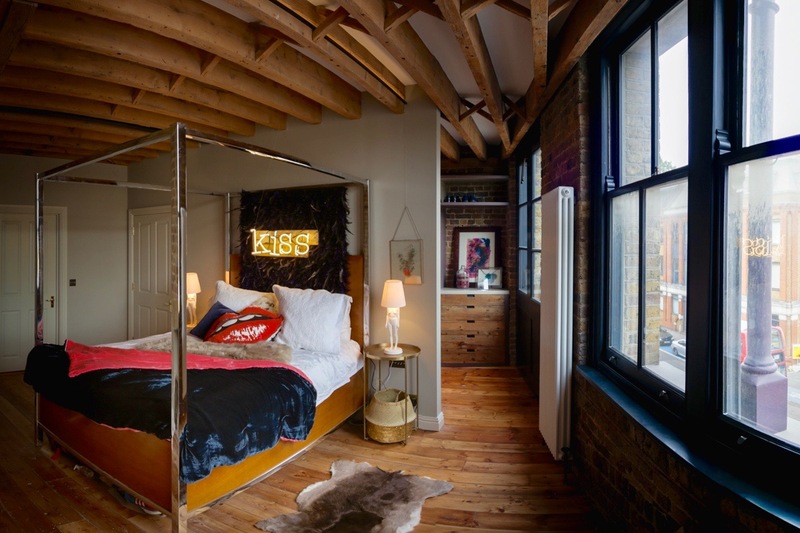 This loft conversion is a master bedroom, crafted and restyled by Brandler London using numerous types of wood. 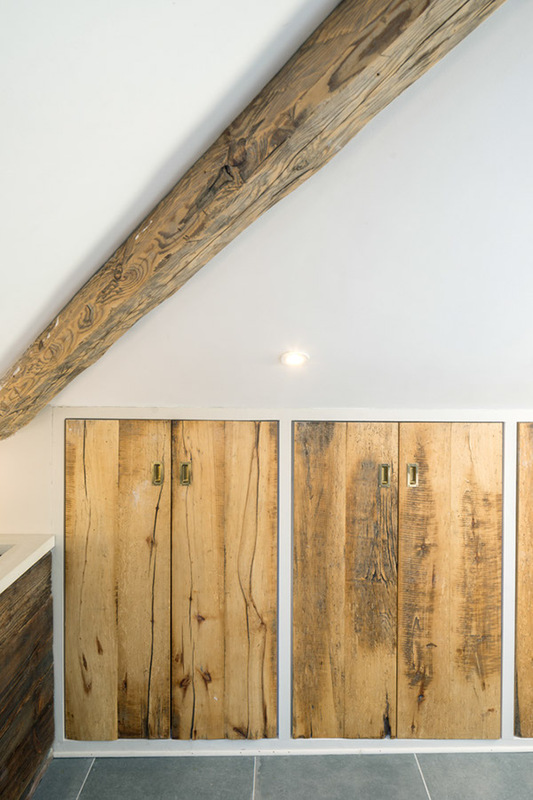 The main wardrobes here are constructed out of reclaimed wood from a beekeepers barn in continental Europe, with the horizontal wood grain arrangement appearing like the storms of Jupiter. 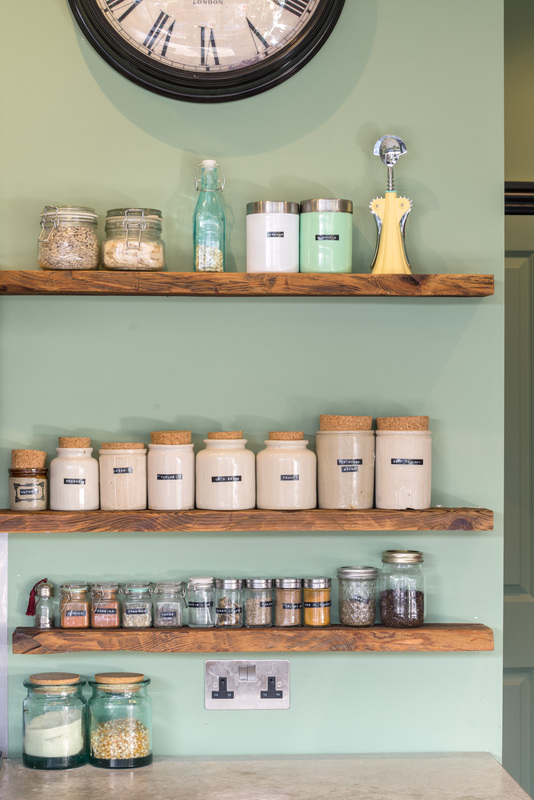 Internal drawers, shelves, and hanging wardrobe space all painted with Pelt by Farrow & Ball. 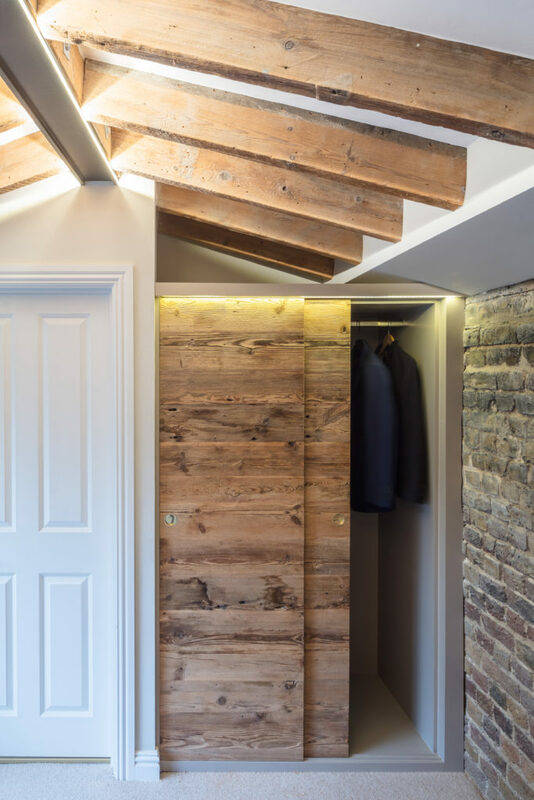 The down lighting creates dramatic shadows on the wardrobe fronts and illuminates the inside when the doors are opened. 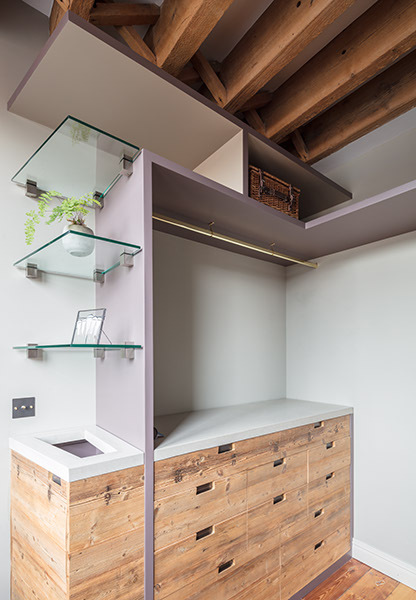 These wardrobes wrap around the perimeter of the room with glass shelves, concretes worktops, and a vanity unit with a number of built-in drawers and LED up lighting. 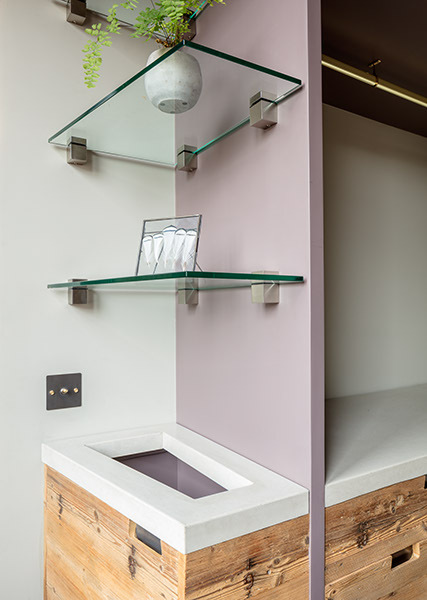 The vanity surface culminates with a drop into a laundry alcove. 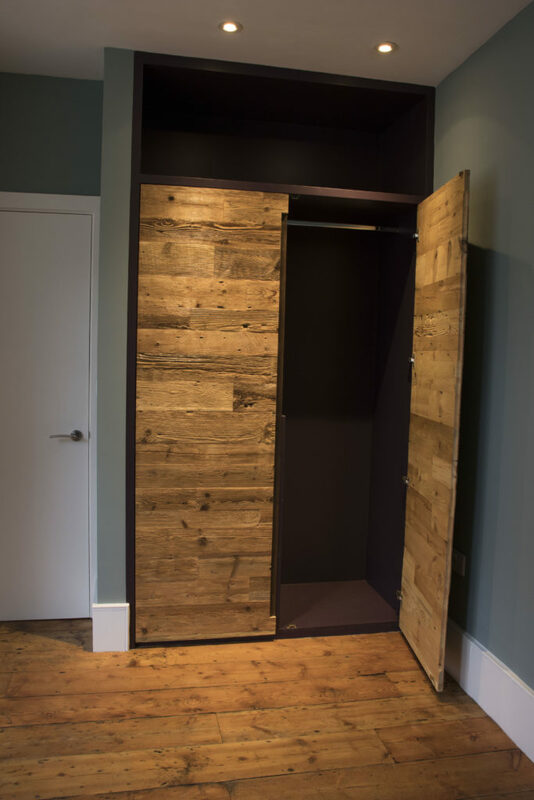 A line of light coloured pine doors house a run of low-level hanging wardrobe space with more storage behind. 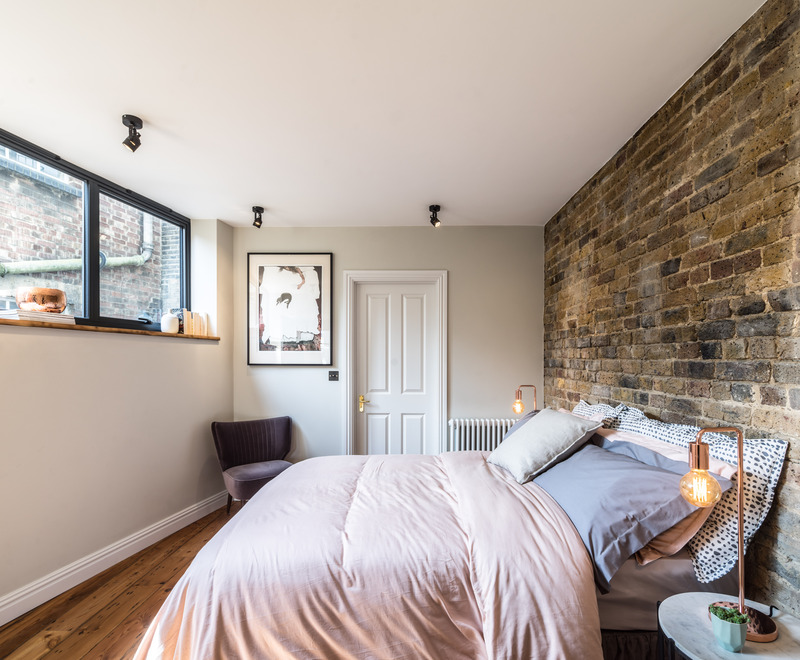 With wood-clad steels and a reclaimed sliding door from an old London warehouse, this bedroom possesses a cozy warmth while providing the necessary storage of a modern master bedroom. Blending a modern aesthetic with the owners’ own sense of whimsy, these varying and textured surfaces go above and beyond and conceal the entry into a secret hideaway room. 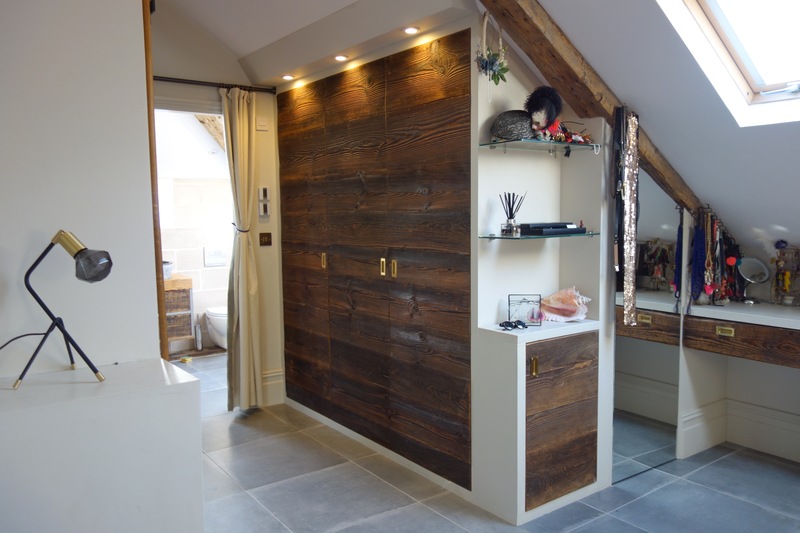 This pair of barn wood wardrobes made with a blend of different textures and colour, joined horizontally with the grain flowing from one door to the next. 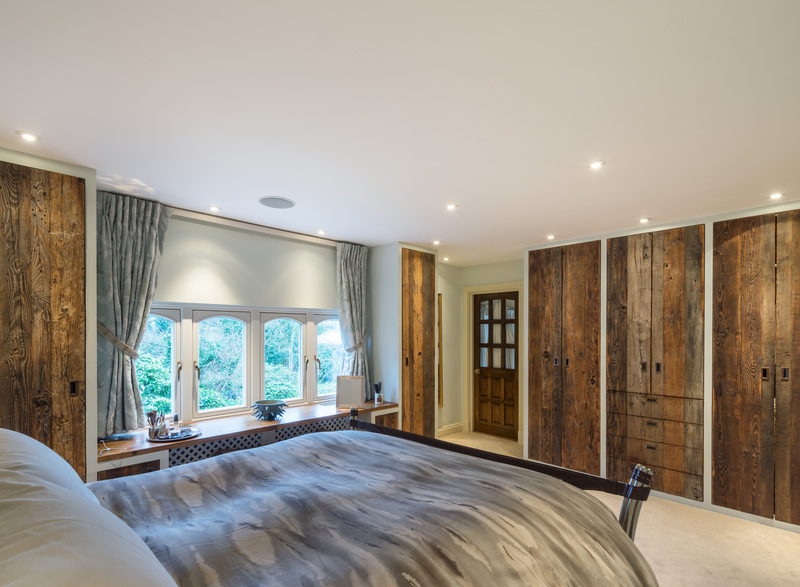 Both were painted with Farrow and Ball Pelt and had open storage space above the wardrobe doors. 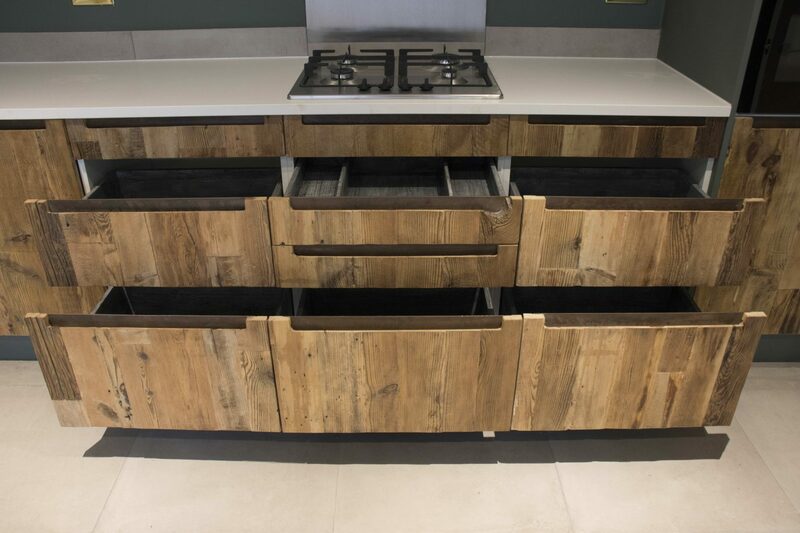 Routed handles with steel back plates once again finish off these classic Brandler london cabinets. 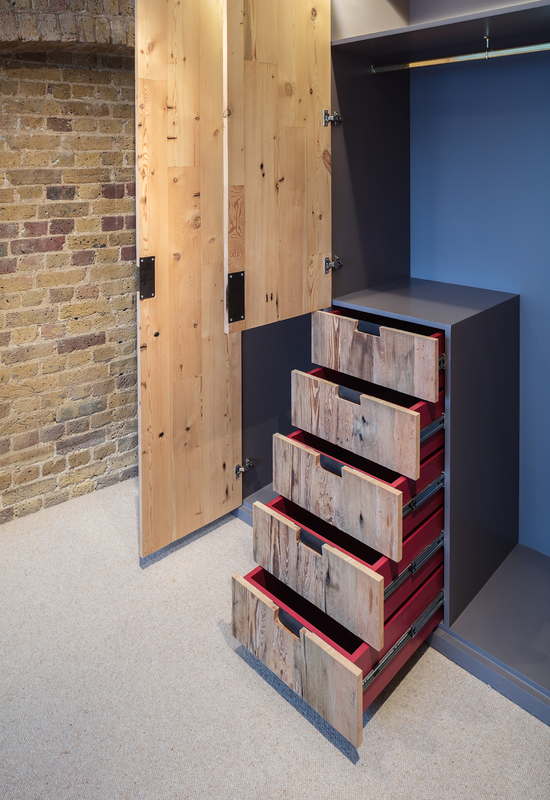 These Brandler London wardrobes provide this sleek, modern bathroom plenty of much needed storage as well as large swaths of warmth and colour. 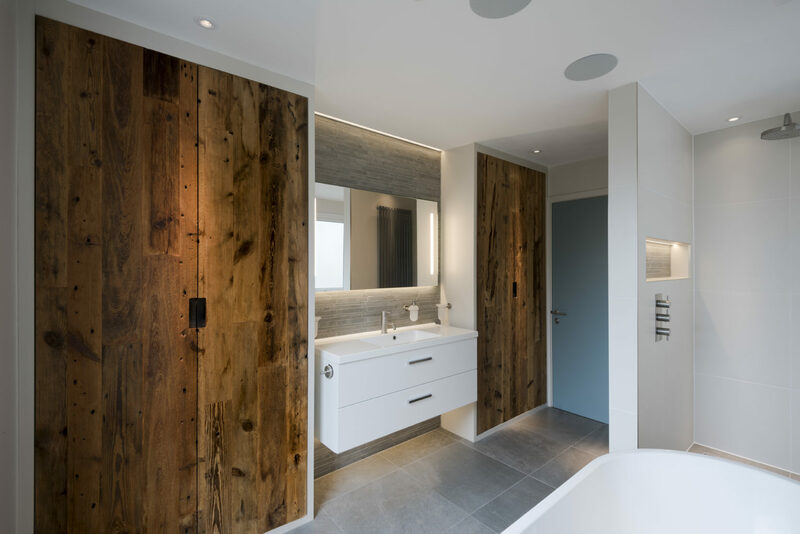 Two full height wardrobes flank the basin and mirror creating a formal yet functional bathroom feature wall. 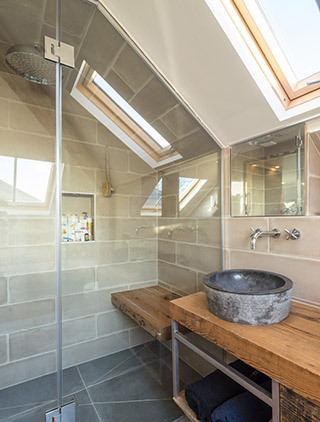 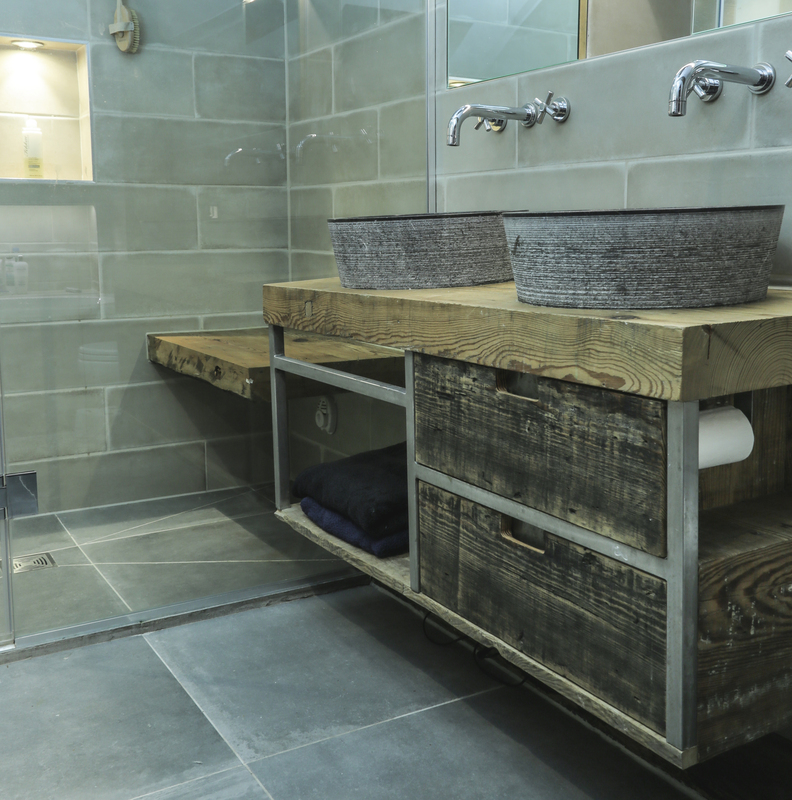 Opposite, a free standing tub is allowed to show off, free from any bathroom clutter. 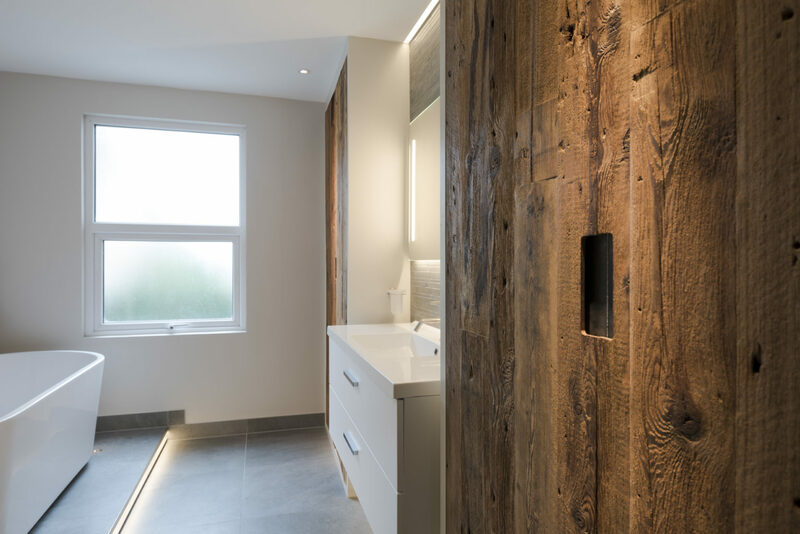 The rough textured wood appears in high contrast with the smooth porcelain and stone used elsewhere in the bathroom while the signature Brandler London recessed door handles fit well within the space’s modern aesthetic. 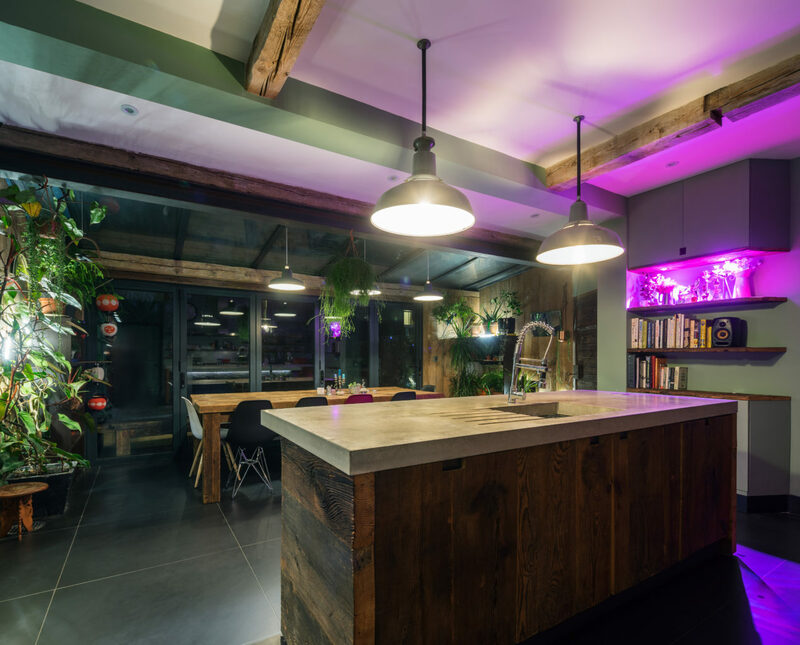 We worked with lighting designers DLighting on this project. 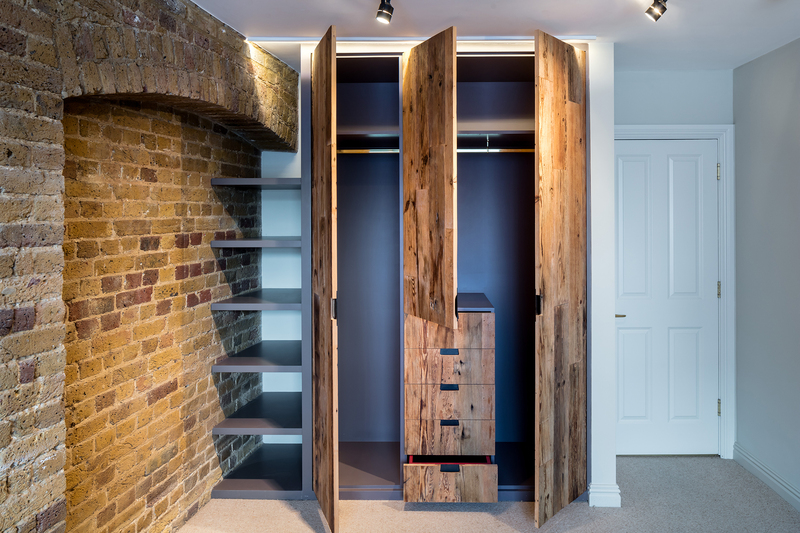 With brass recessed handles and quiet sliding mechanism, these guest bedroom wardrobes manage to fit well in a room that also features timber beams and exposed london stone brick. 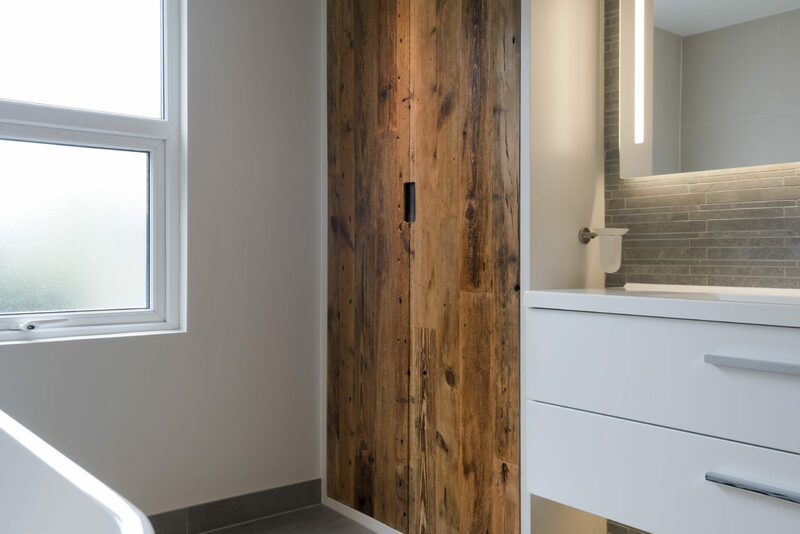 The reclaimed wood doors were assembled with the grain oriented horizontally to highlight the wood’s natural features as well as correspond with the other linear elements in the space. 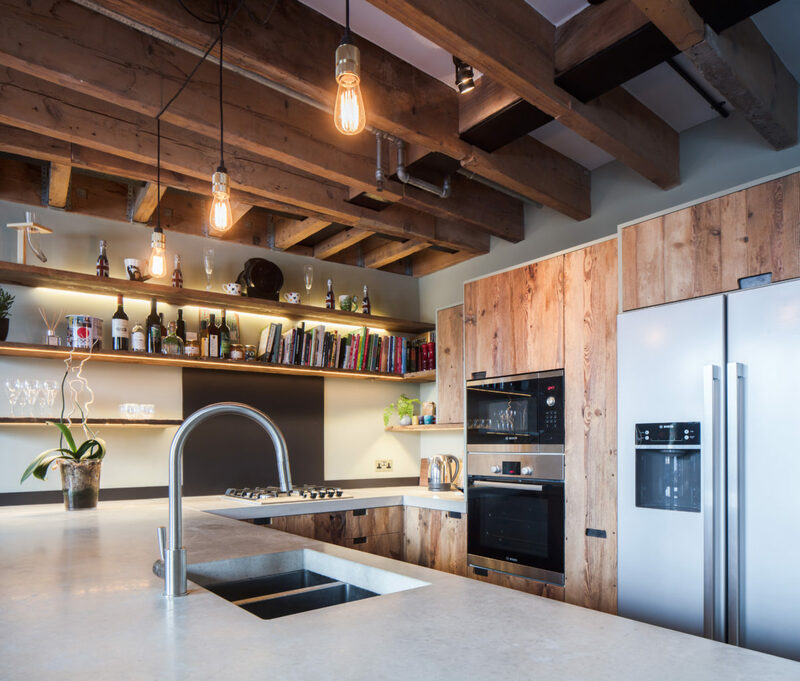 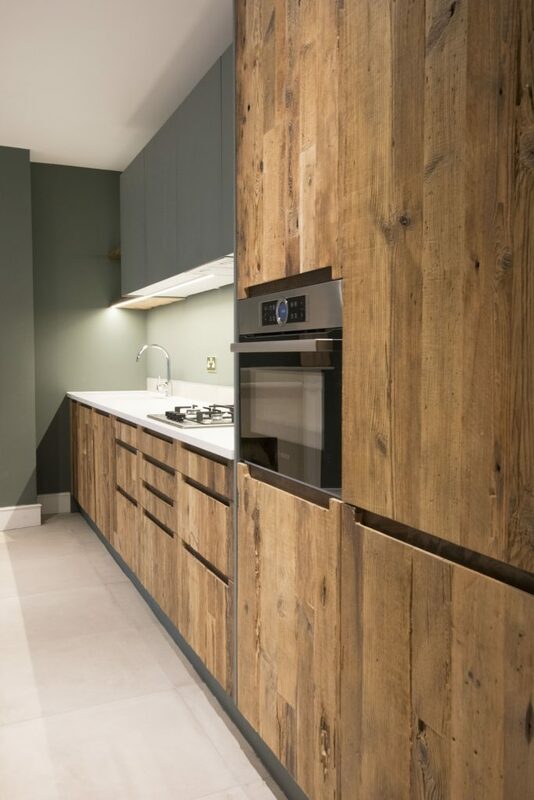 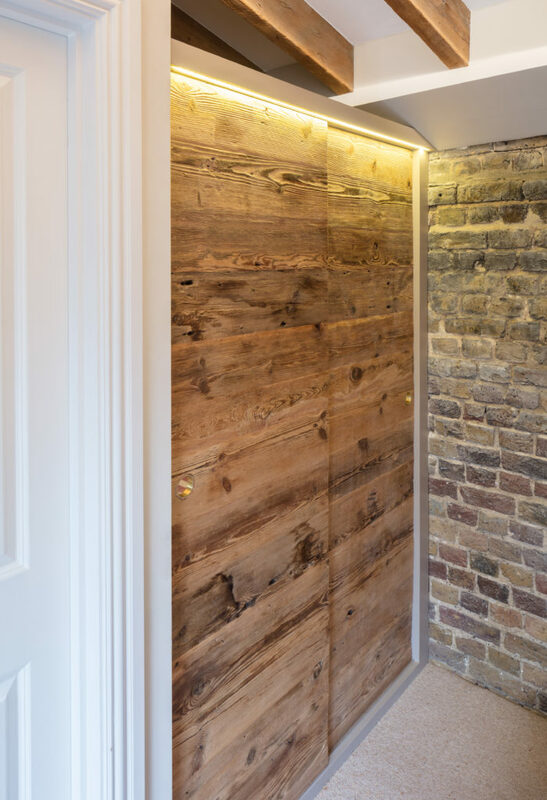 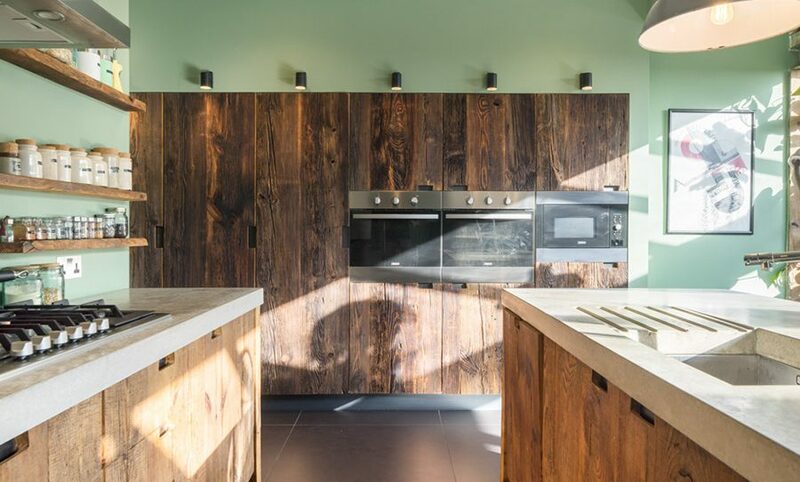 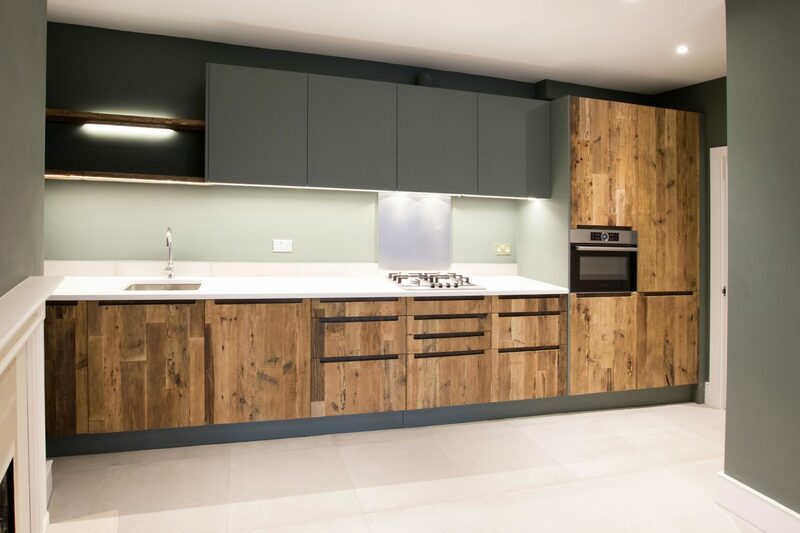 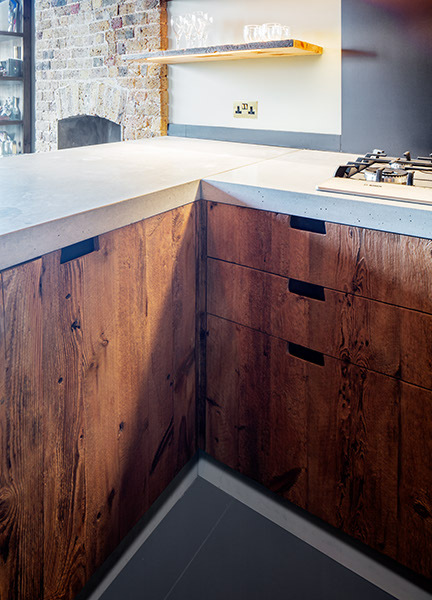 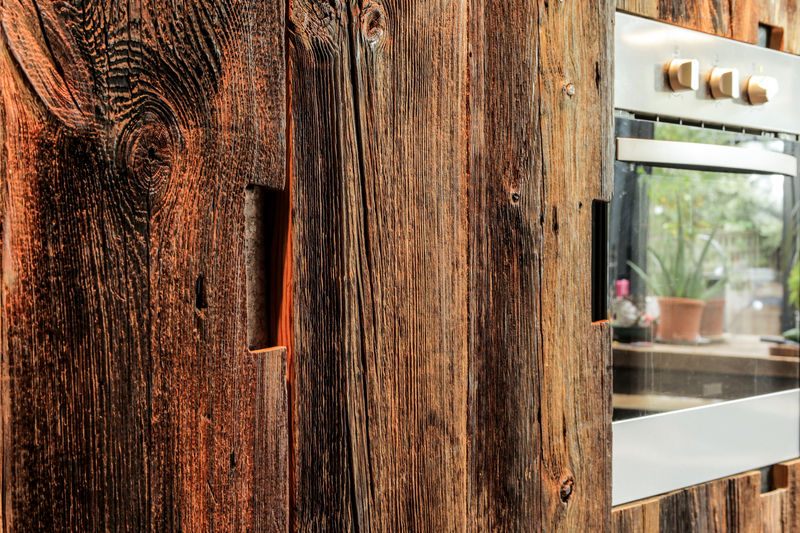 LED downlighting accentuates the texture of these bespoke reclaimed wood doors. 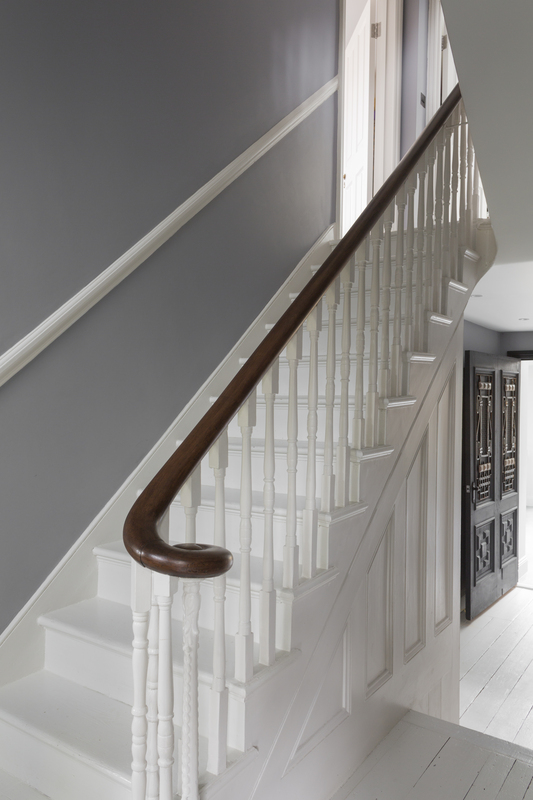 Painted internally with Farrow and ball London Stone. 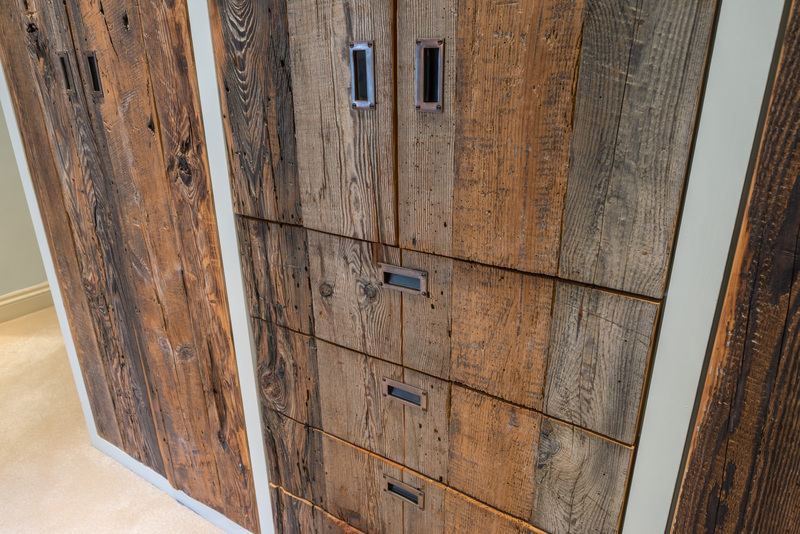 With LED down lighting and handcrafted recessed handles, this wardrobe’s dramatically textured doors take centre stage. 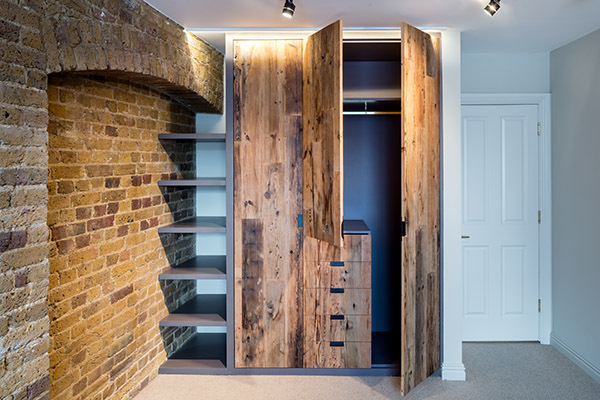 These wardrobes are hinged with integrated shelving. 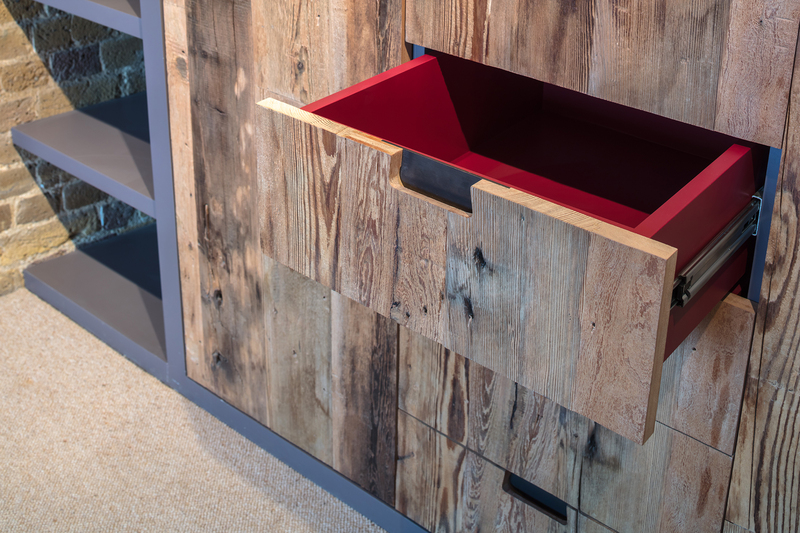 The built-in drawers feature a smooth interior painted finish in Radicchio by Farrow & Ball. 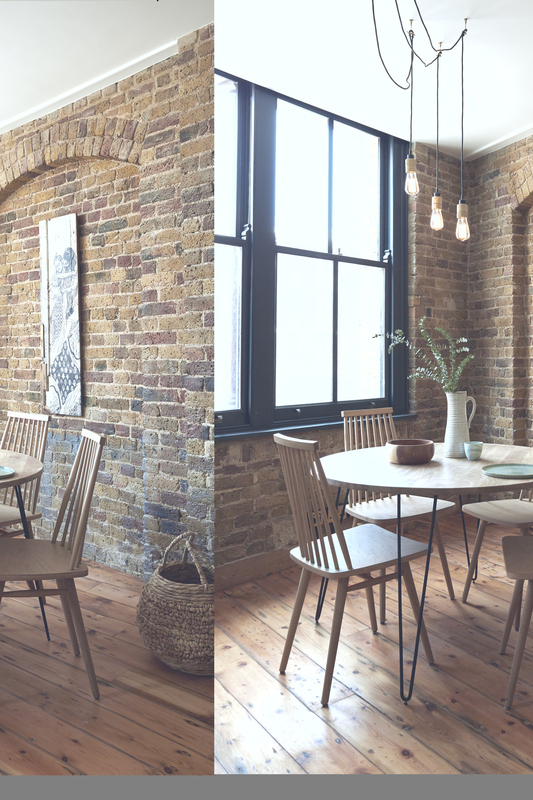 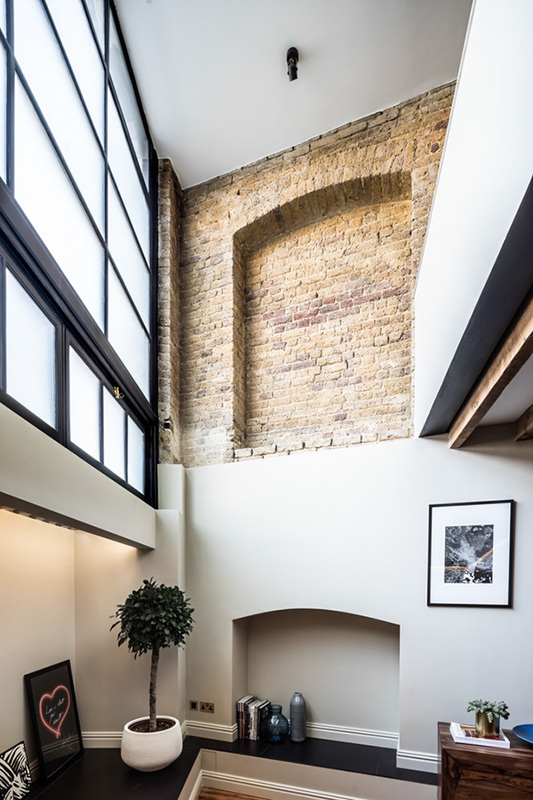 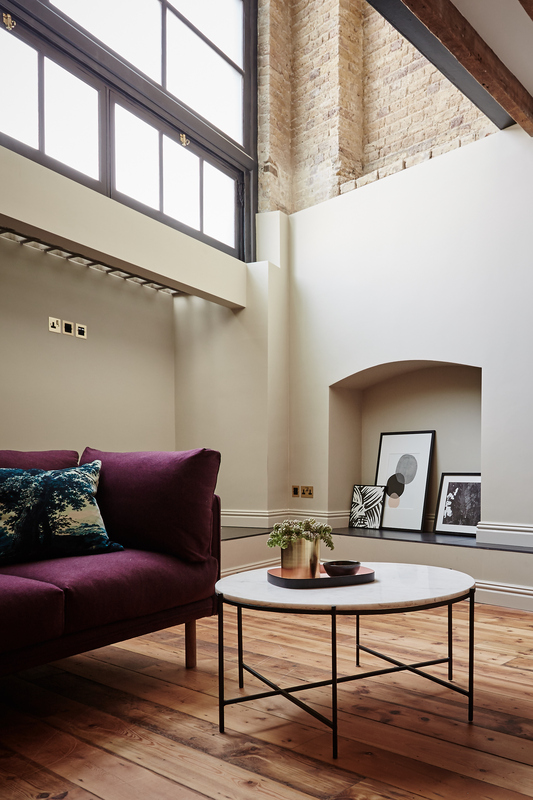 The full-height storage is built to fit the space, allowing for maximum return on your wardrobe outlay while sympathetically setting itself apart from the Victorian arches of this old warehouse. 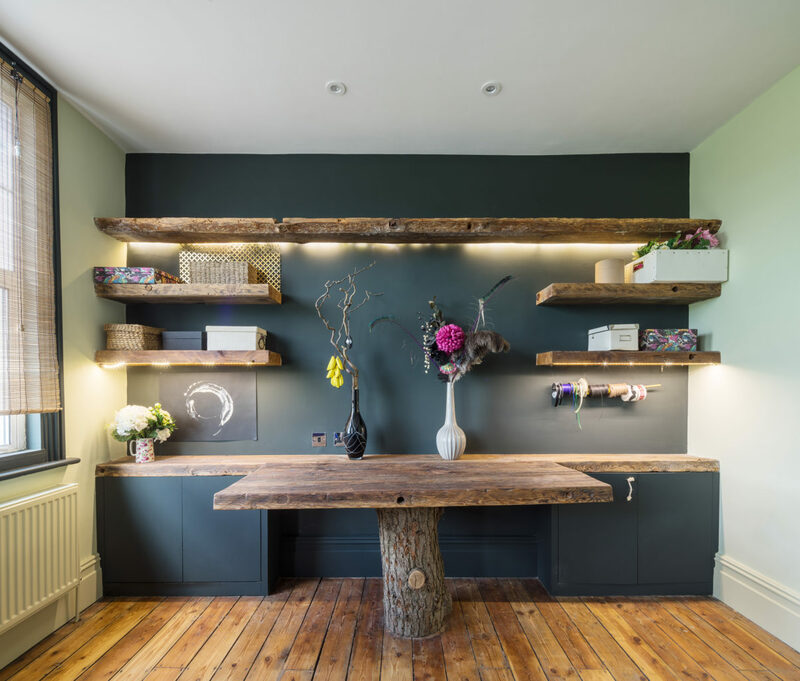 The open shelf space that remains rounds off a functional and aesthetically pleasing project. 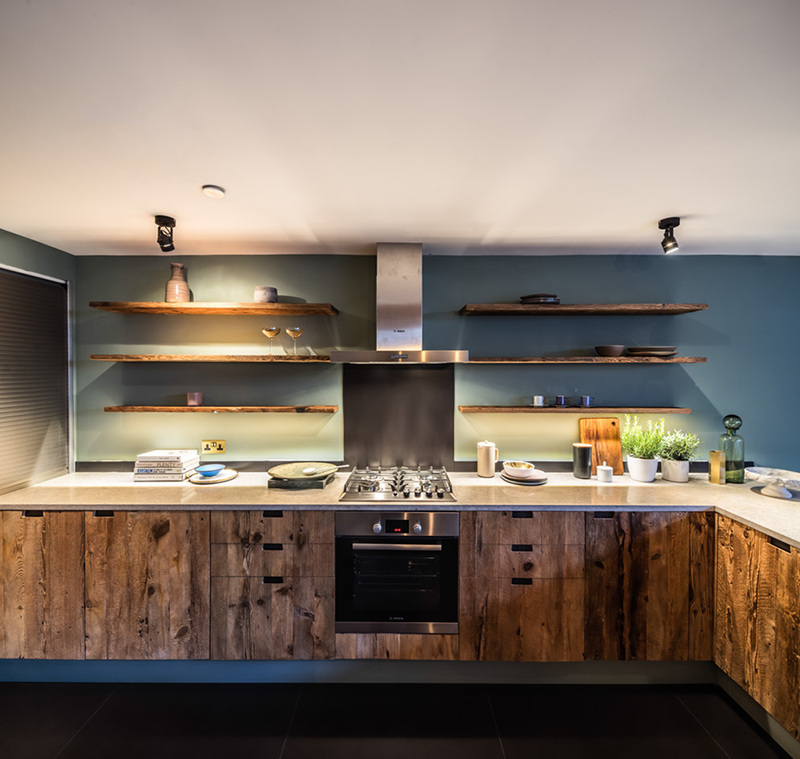 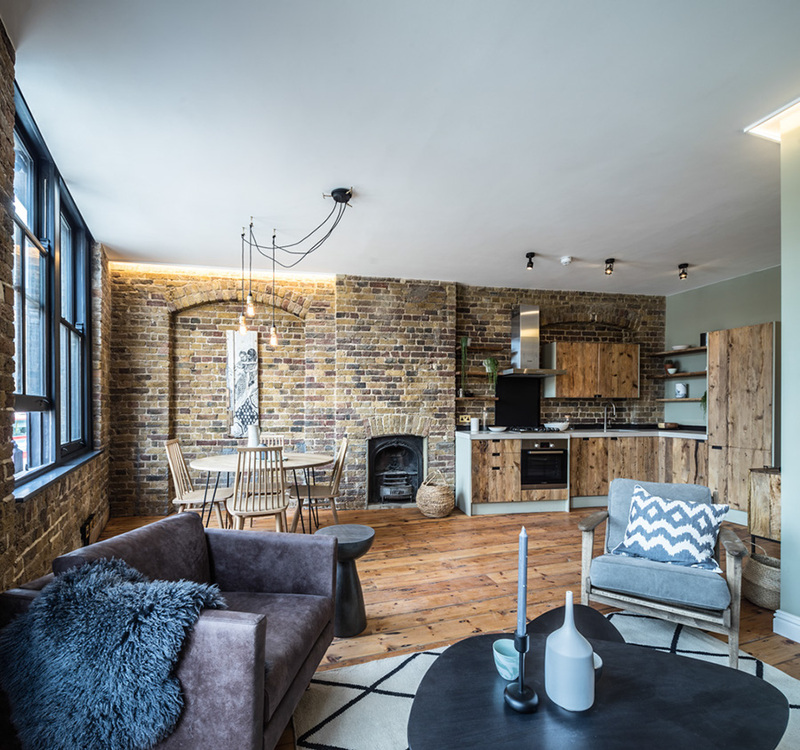 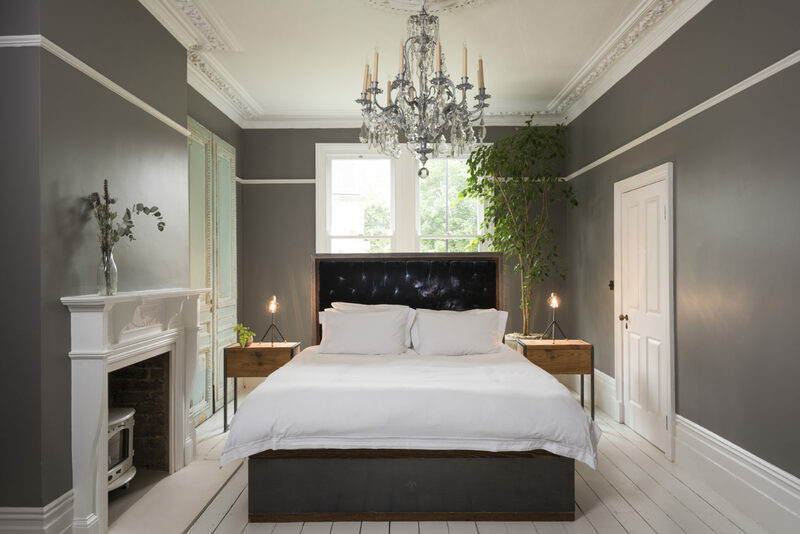 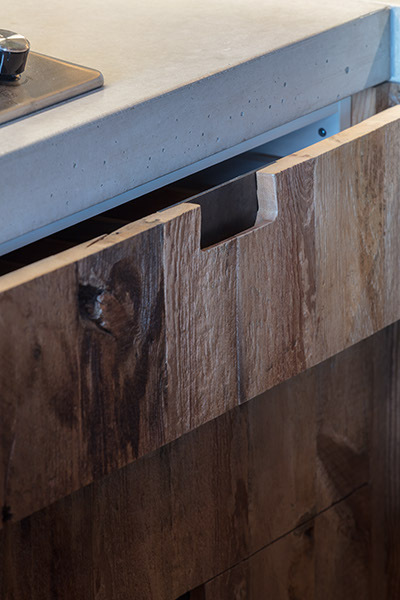 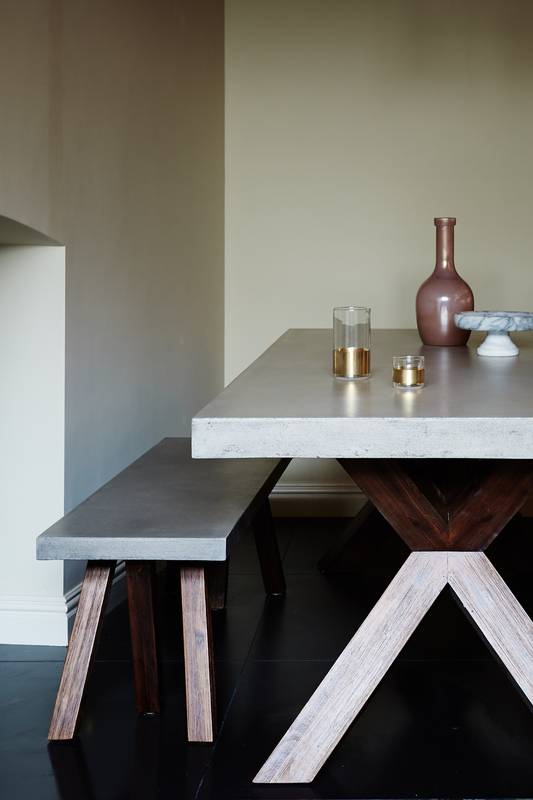 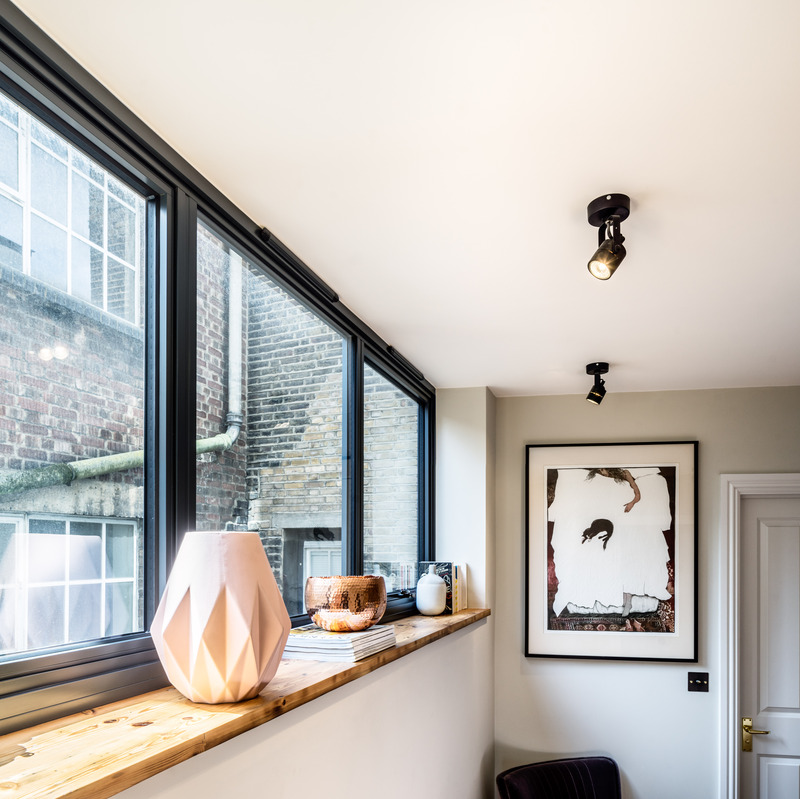 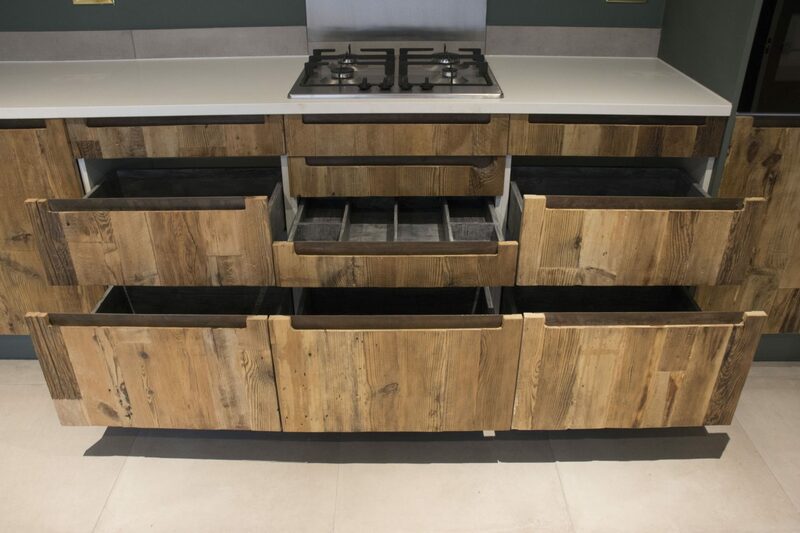 Brandler London can design and build all types of bespoke furniture, from vanity or AV units, to massive steel and reclaimed wood tables or beds. 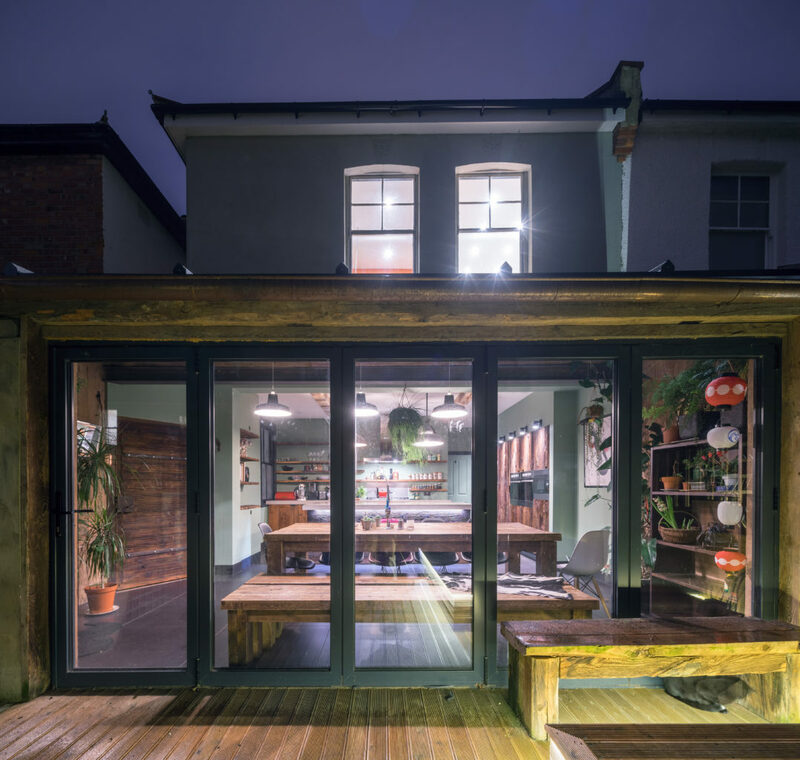 We are very passionate about helping people with creative and playful projects. 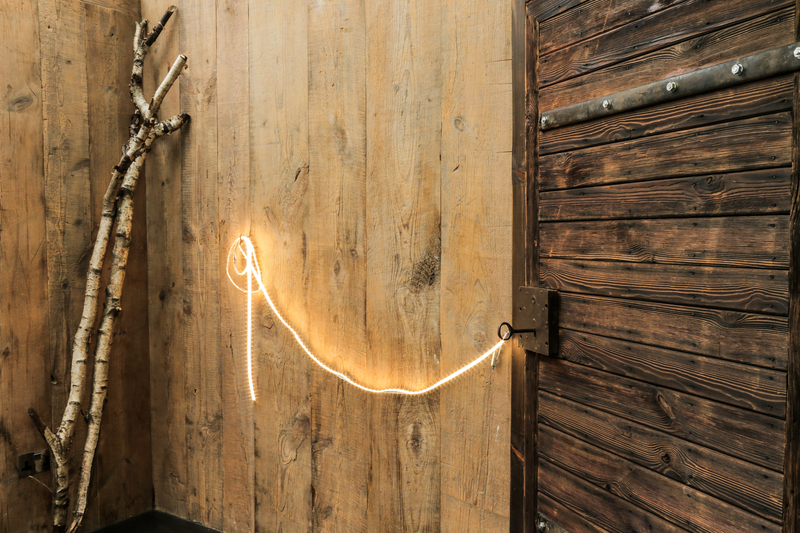 No idea is too outrageous. 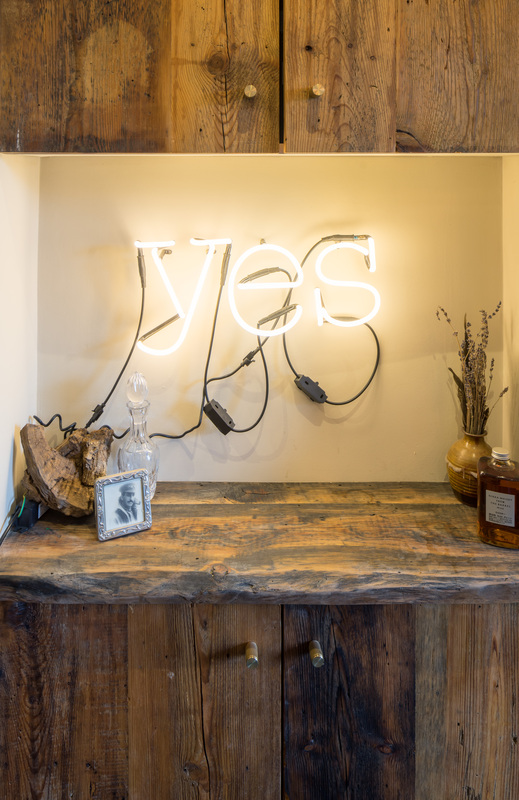 Therefore, we encourage our clients to tell us all of their imaginative ideas, unrestrained. 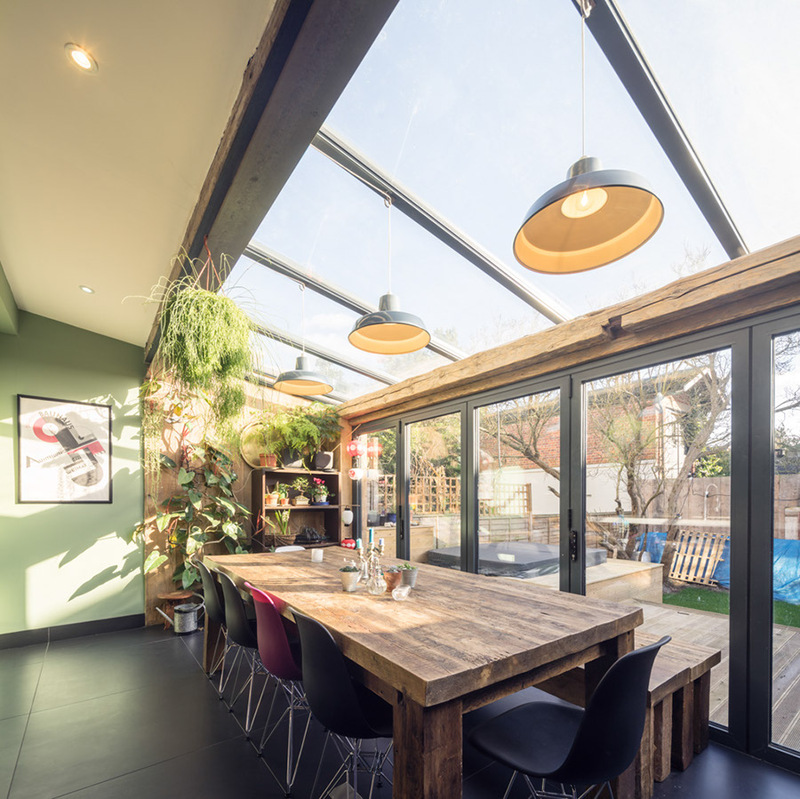 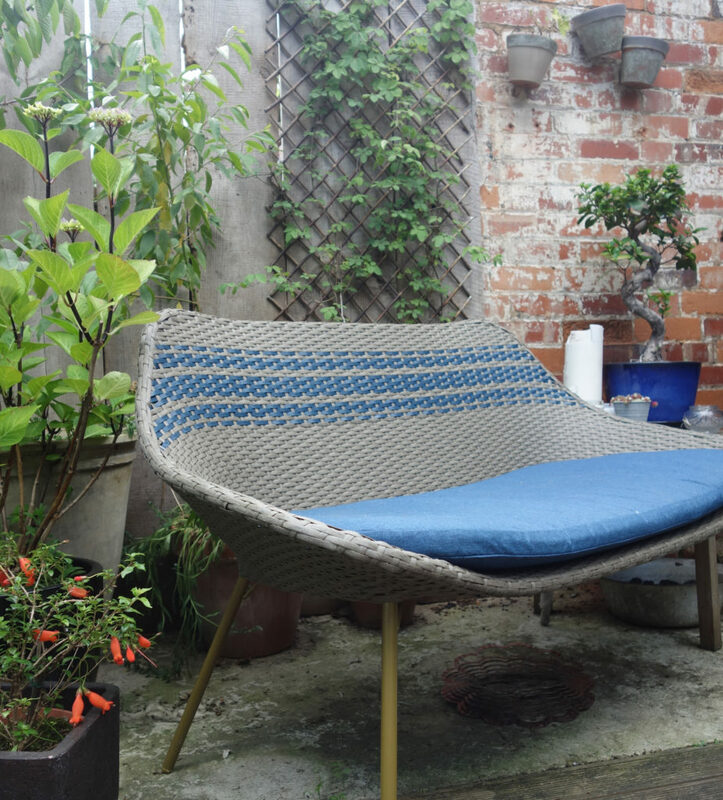 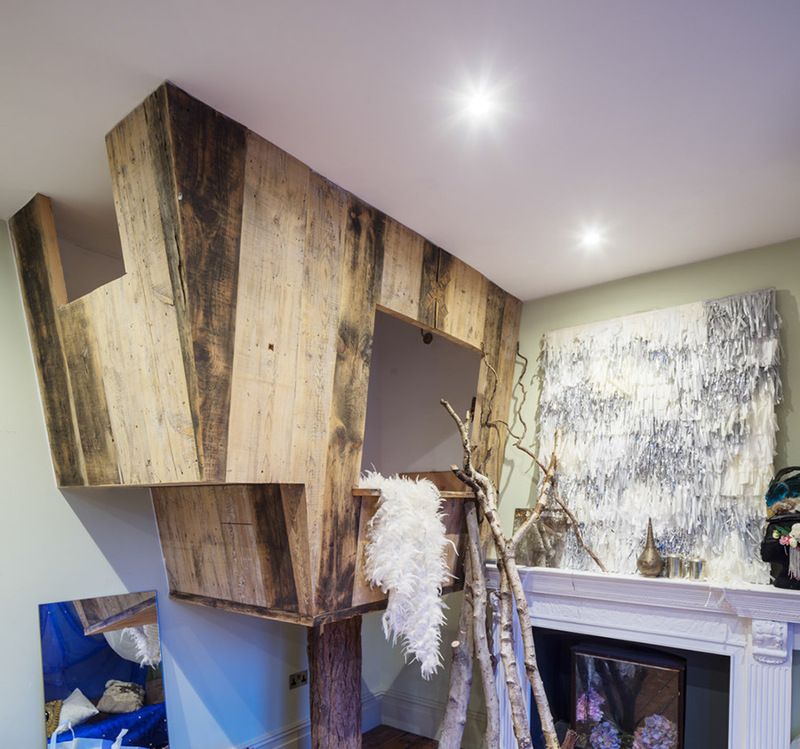 However, if you would like us to take the creative lead in designing a unique space or piece of furniture we’d be delighted to assist, from indoor trees houses to arts and crafts work areas, from kids bedrooms to secret passageways. 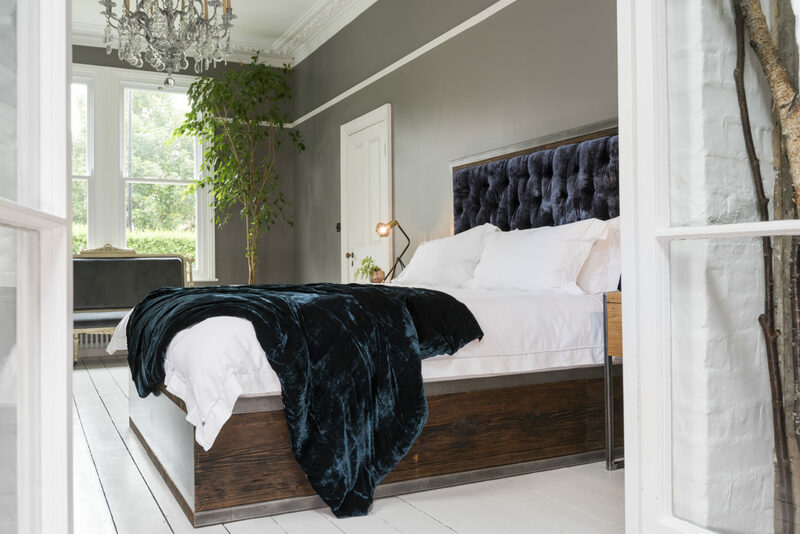 Combining warm wood, raw metal, and tufted silk velvet, the Brandler Bed fits well in a modern design context while maintaining the character and comfort one wants in a bedroom. 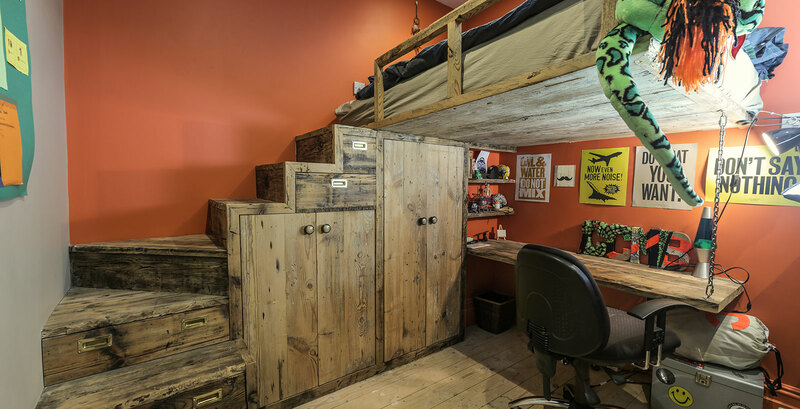 The base is visually grounded with large planks of honey-toned reclaimed wood that serve to conceal practical under-bed storage. 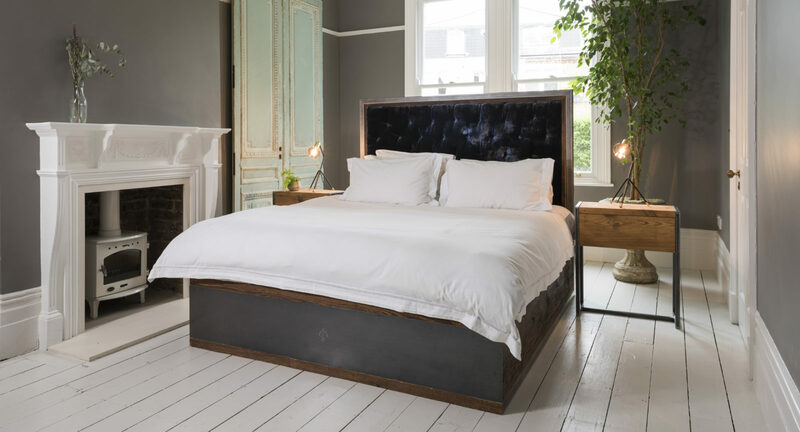 The headboard is upholstered and hand-tufted in a deep blue velvet adding a classic sense of luxury and a soft place to rest one’s head. 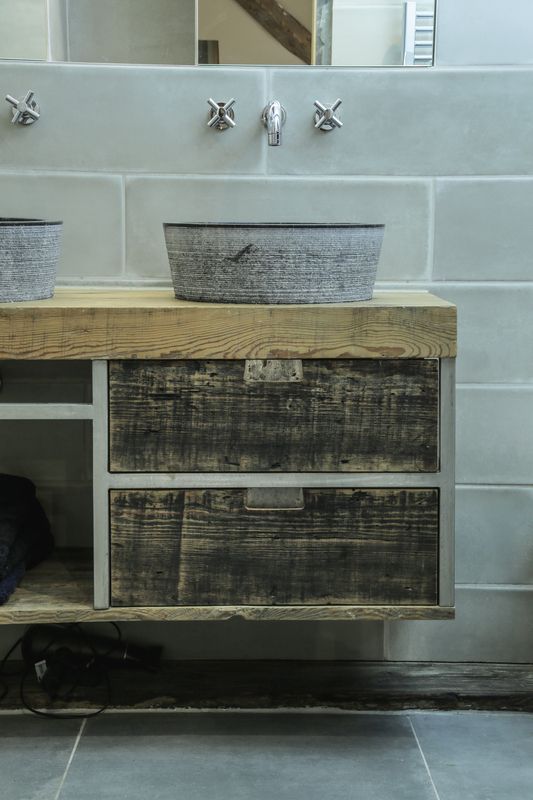 The steel frame ties these two materials together and adds a sleek industrial flavour to the domestic piece of furniture. 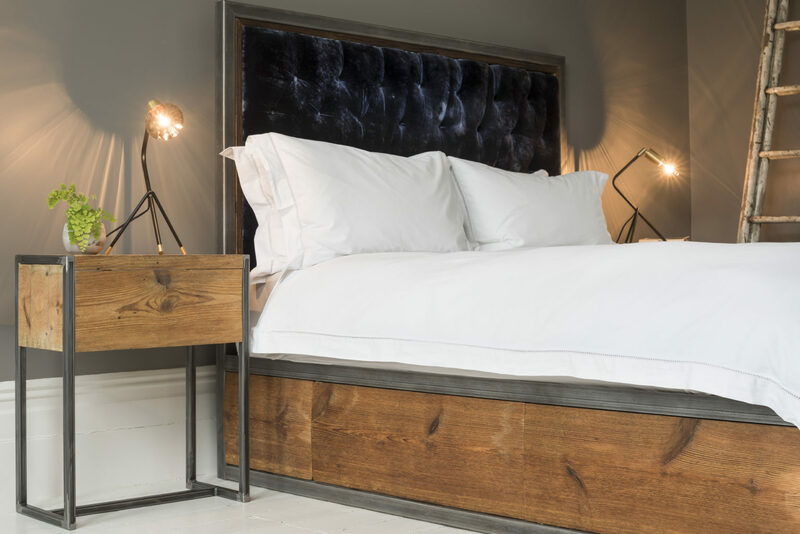 Brandler beds are built bespoke and can therefore be customised with each client’s style or storage needs. 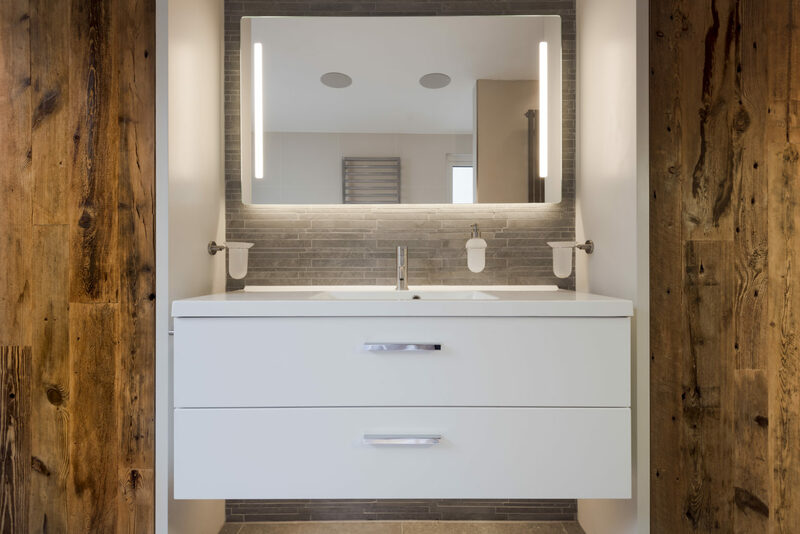 The Brandler Vanity works great in bathrooms that require a sleek, modern aesthetic but also need an element of warmth and texture. 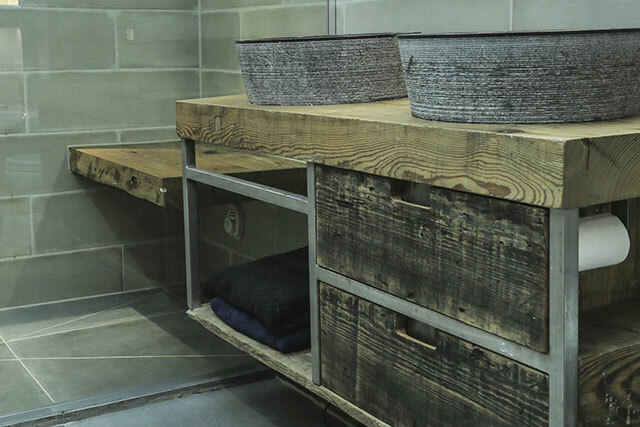 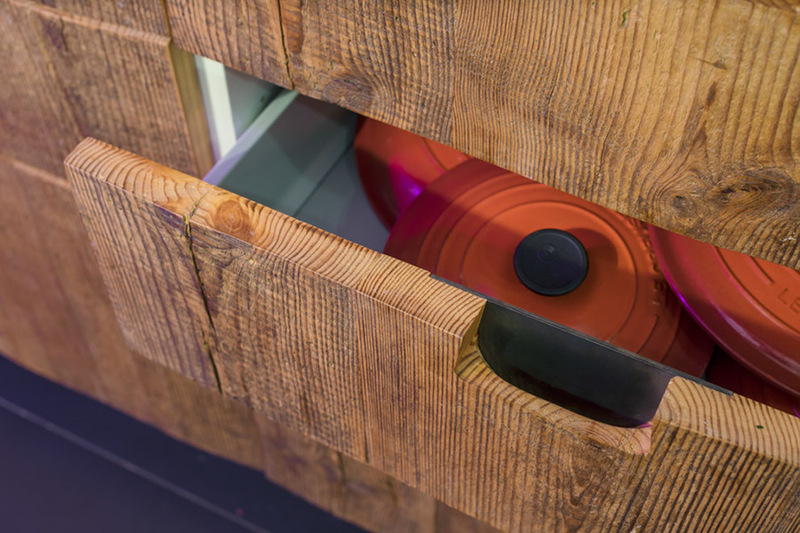 Constructed with a mild steel frame and a thick slab of our reclaimed larch, the Brandler Vanity is attached straight into the wall to create a contemporary floating appearance. 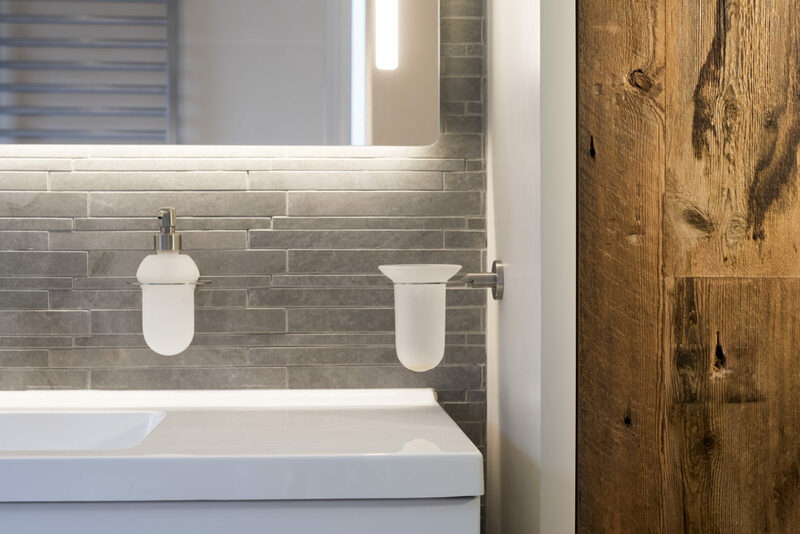 All of the reclaimed wood used on Brandler bathroom vanities are sealed with three layers of a prim oil undercoat, used typically in marine applications, and a hard wax oil top coat. 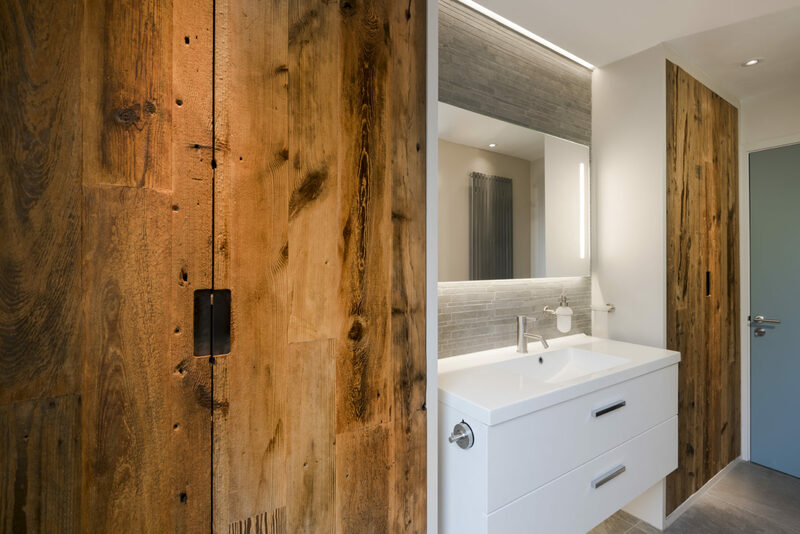 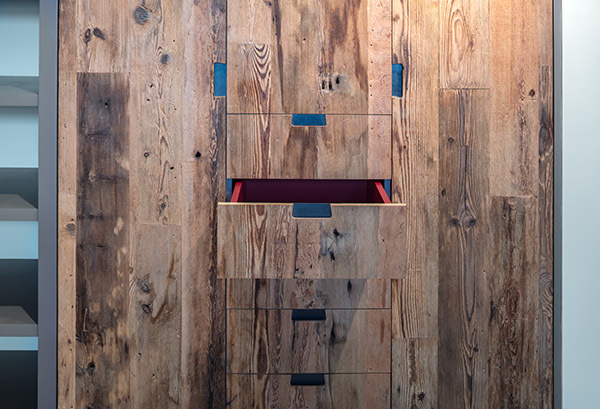 This piece maintains the signature Brandler London look of reclaimed wood and raw materials all while surviving the wear and tear of a bathroom’s daily routine. 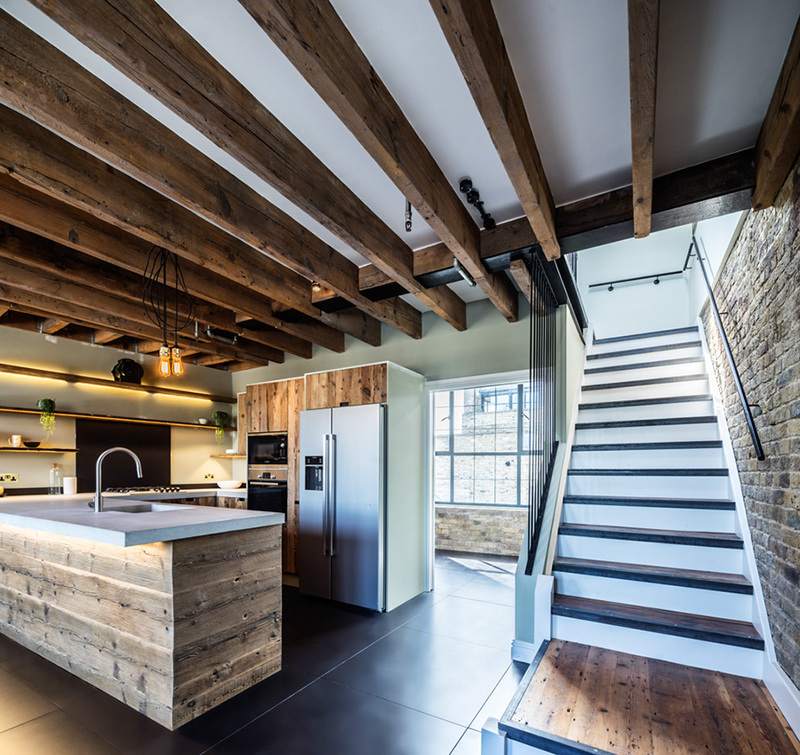 Our structural reclaimed wood can be used for a wide range of internal applications from beams to cladding, staircases to doors, or even tree houses. 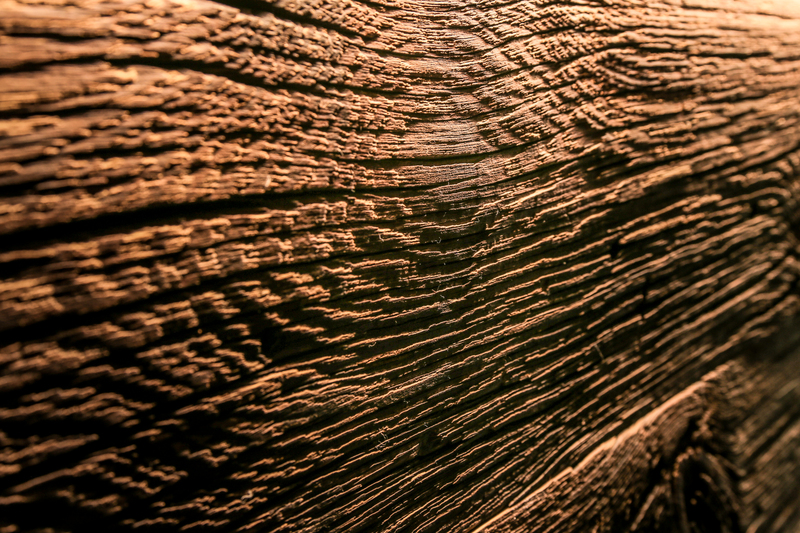 We have wood in all shapes, sizes, and types to suit your needs. 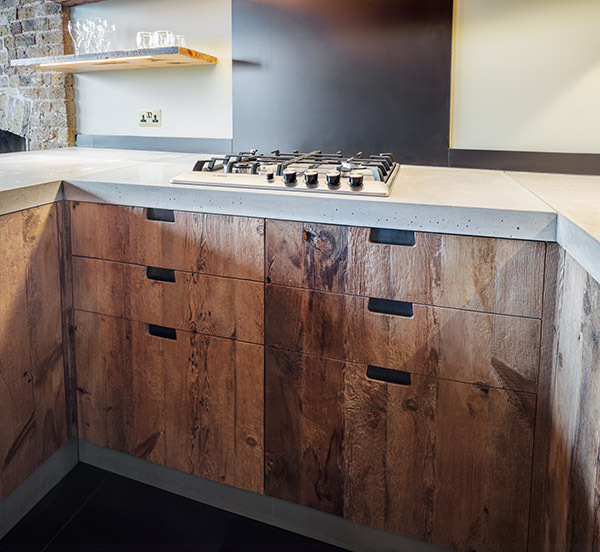 As long as it’s reclaimed wood that you are after, you can be assured Brandler London can supply it. 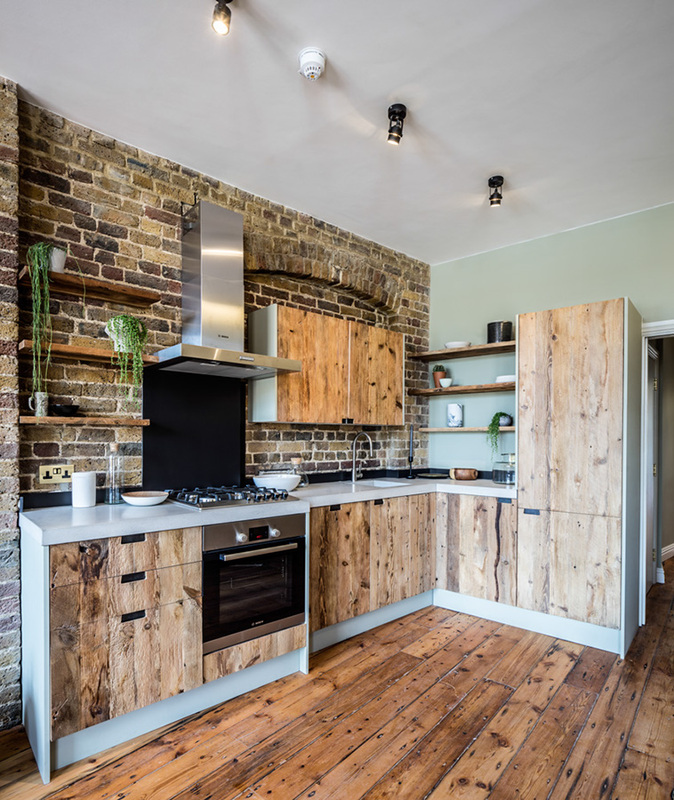 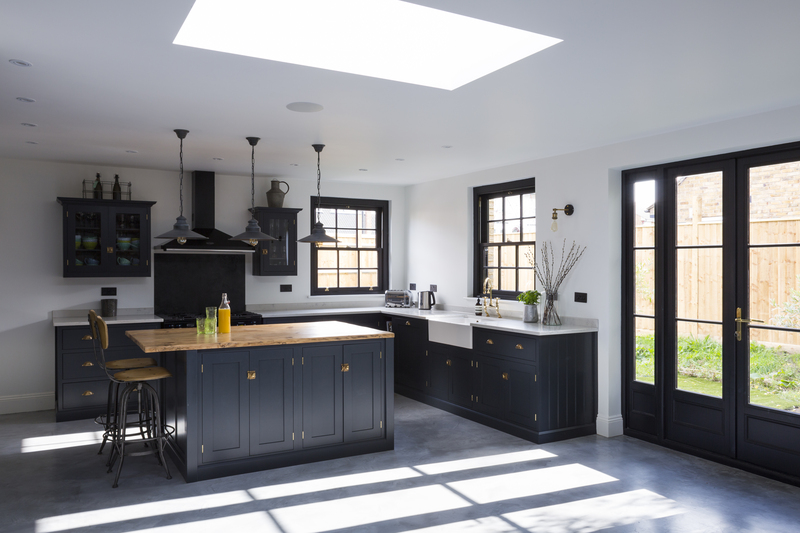 In order to use aged materials that meet modern standards, we use hardwood for structural load bearing items, with larch and oak being our preferred species. 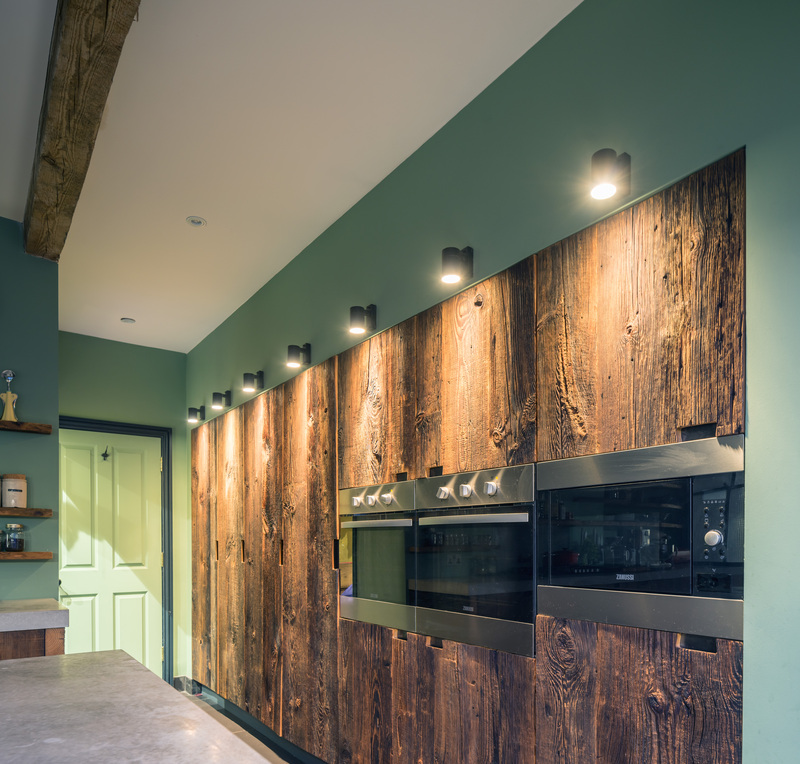 If you are looking to add reclaimed wood for non-structural items, such as cladding for an existing stair or beam, we can offer a range of wood species to achieve your preferred look. 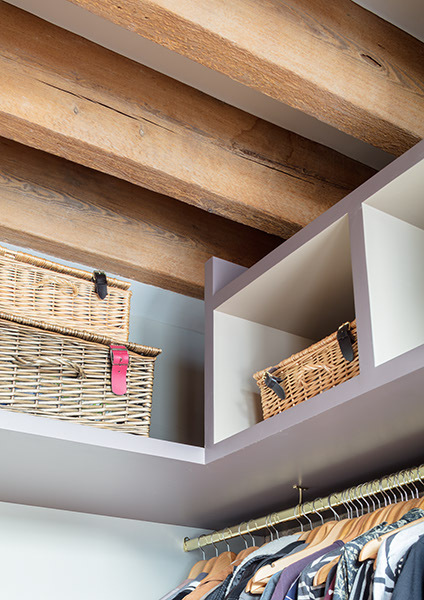 We also offer design and build of bespoke under-stair storage options, From sliding drawers for shoes and jackets to larger general storage cabinets, we can build a beautiful piece to tuck away all your household items. 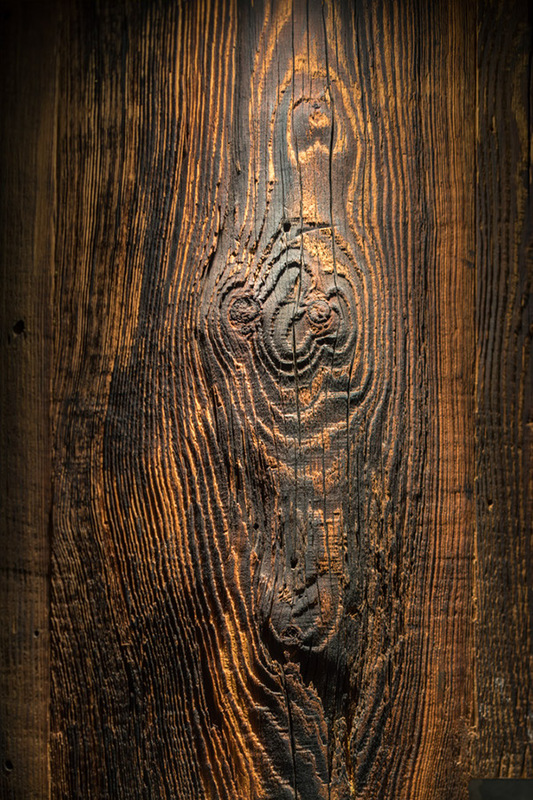 These can come in finishes of any of our wood varieties or painted to blend into surrounding walls. 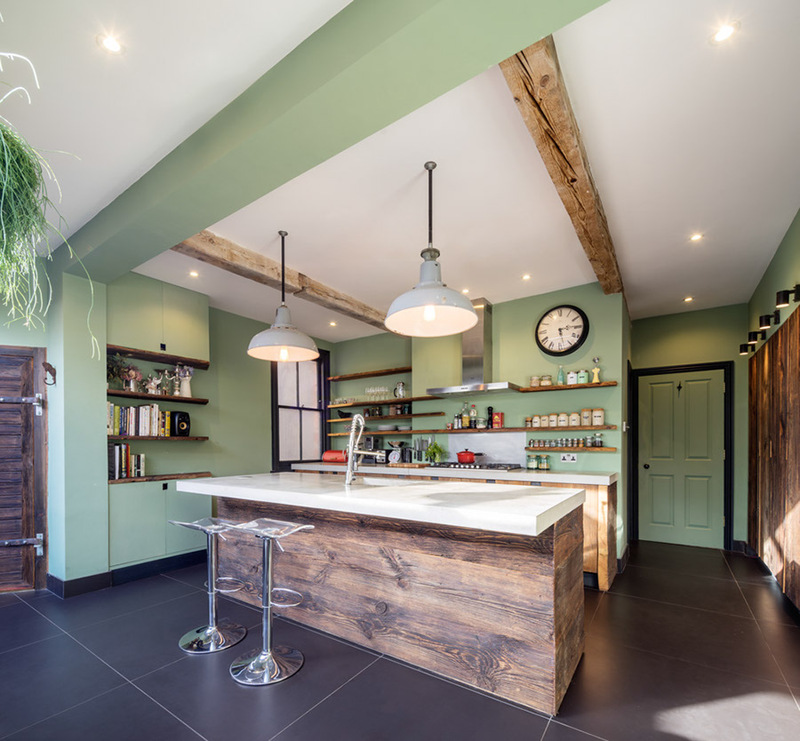 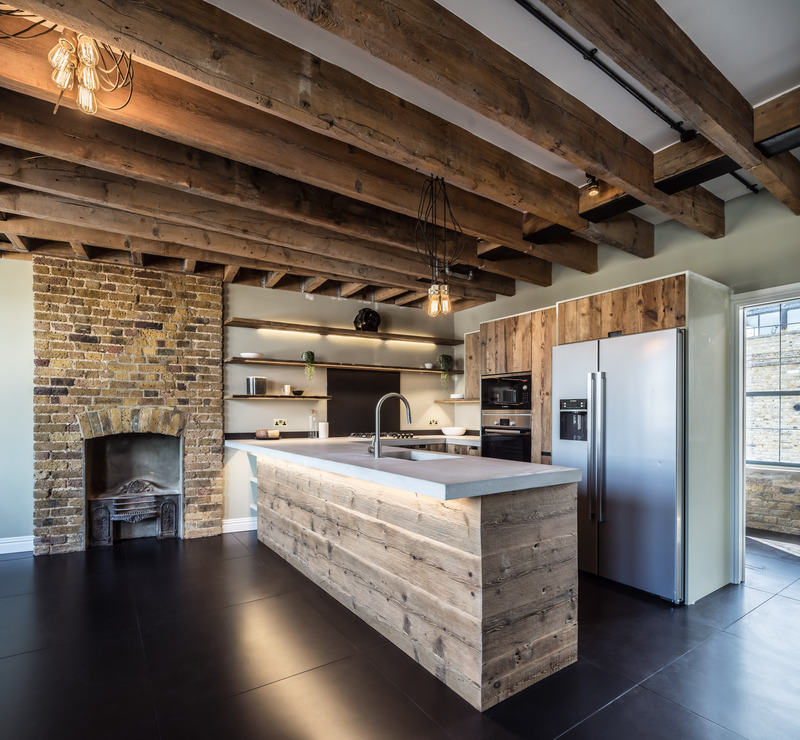 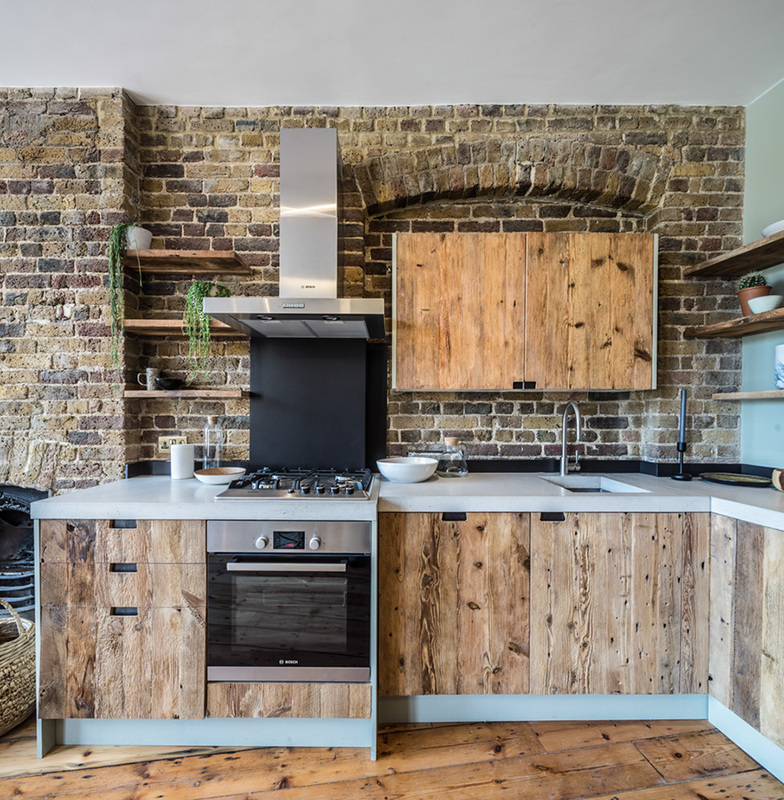 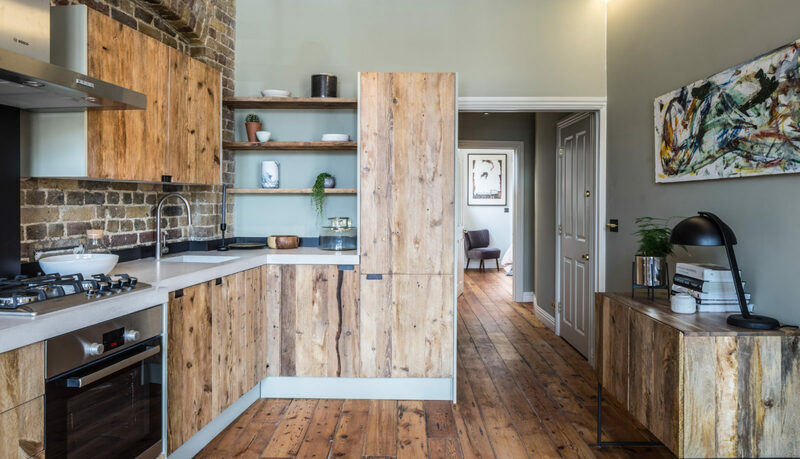 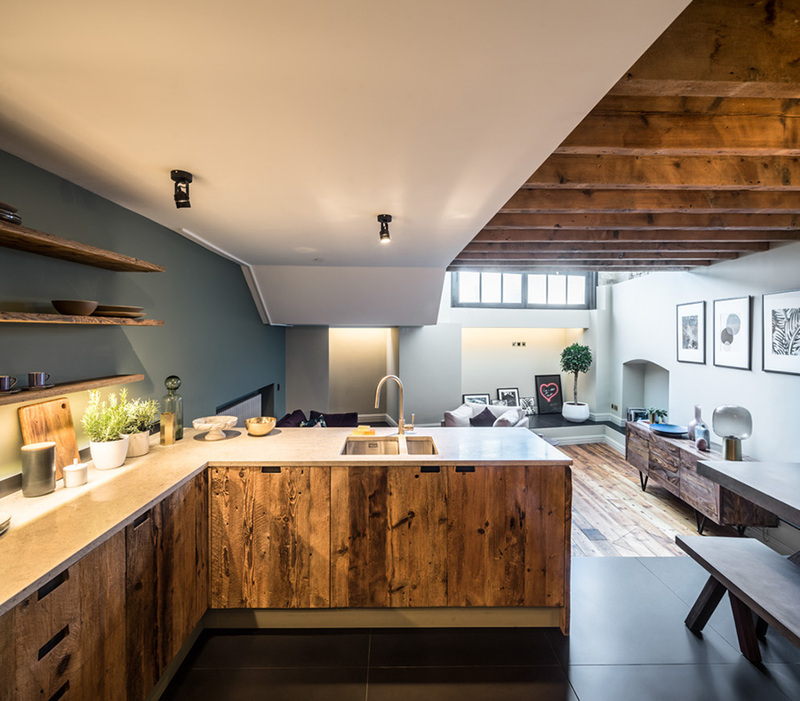 Brandler London’s reclaimed wood can be used to clad interior or exterior walls, kitchen islands, beams, and a myriad of other areas. 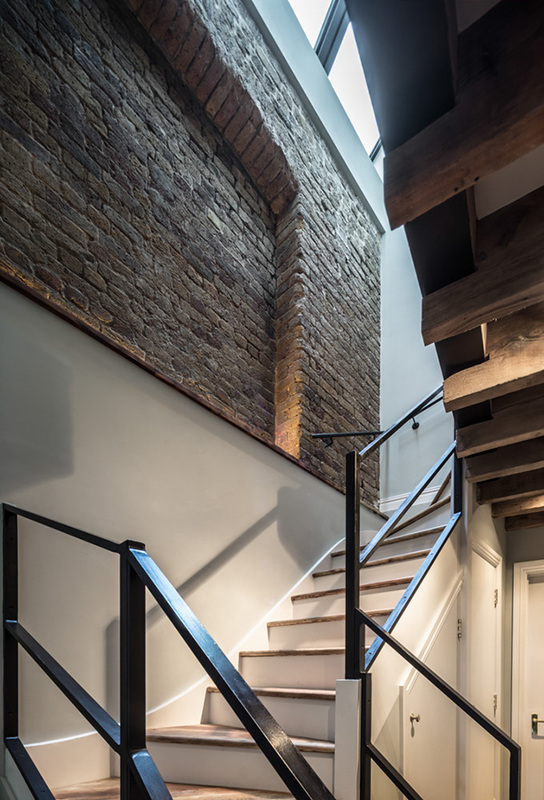 This aged wood cladding gives depth, warmth and texture to any space, helping to hide structural steels or unattractive surfaces on stairs and walls. 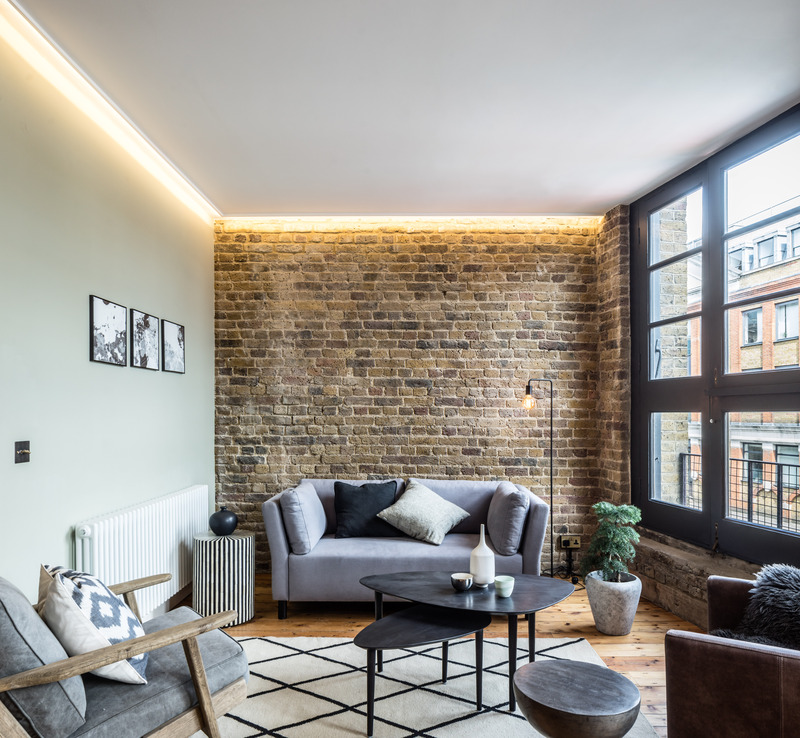 These areas then take on a whole new personality at night, where lighting can be implemented to cast a play of shadow and illumination across the clad surfaces. 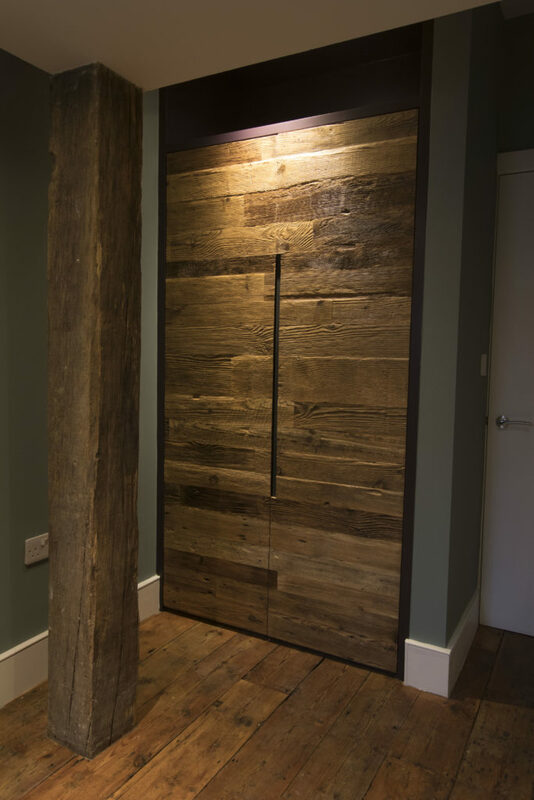 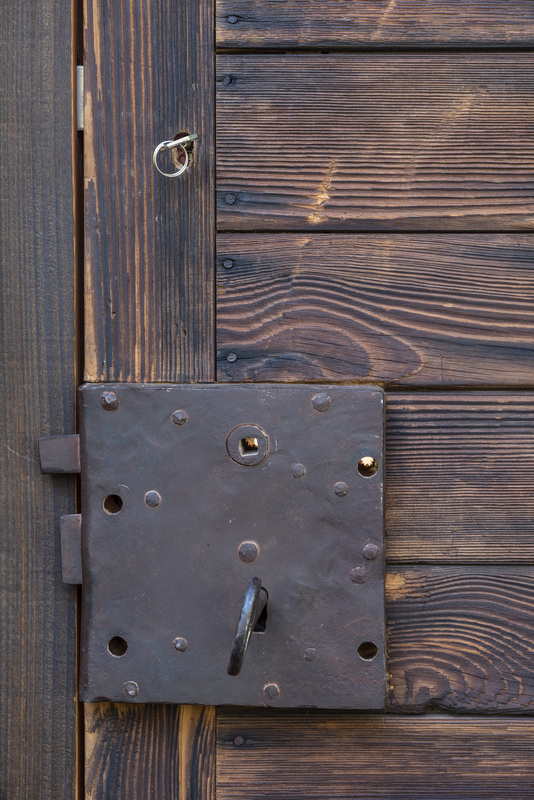 Our bespoke, reclaimed, and hand-crafted doors create a statement in the home or commercial premise. 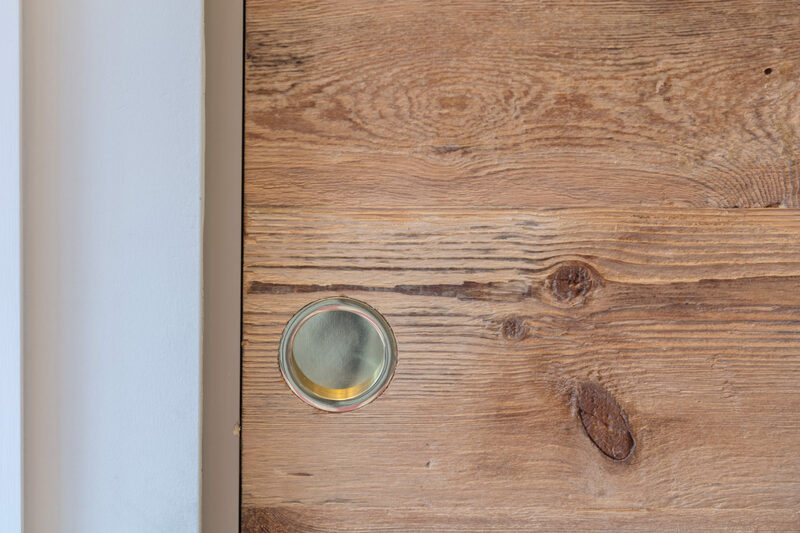 A door, often being the first thing you use when entering a building or room, gives a lasting impression. 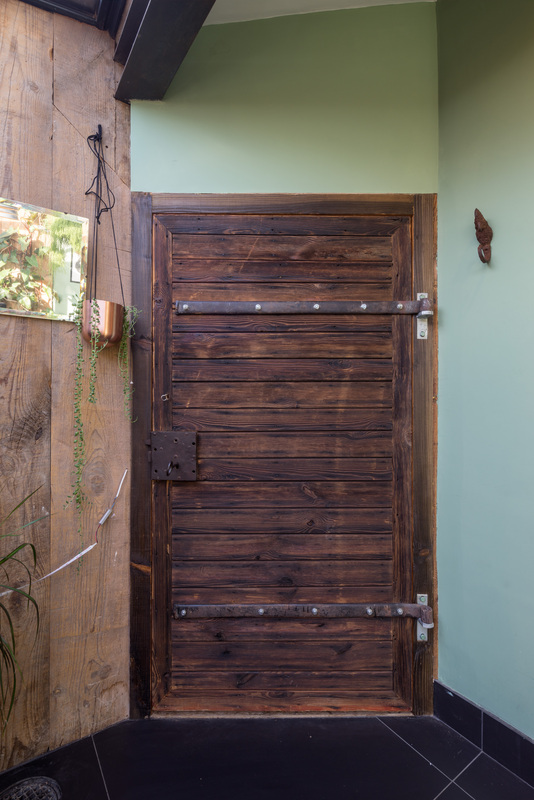 We create doors with big personality that aim to impress. 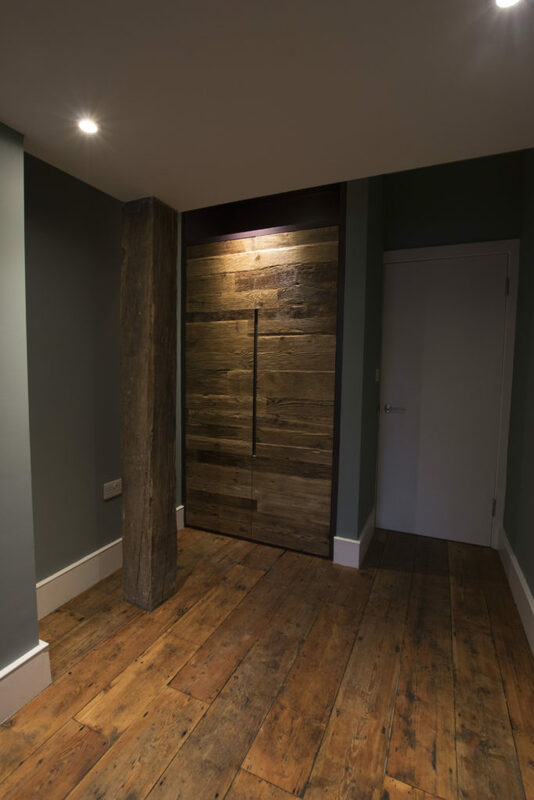 We can design or replicate a door to your specification and manufacture it in our London workshop. 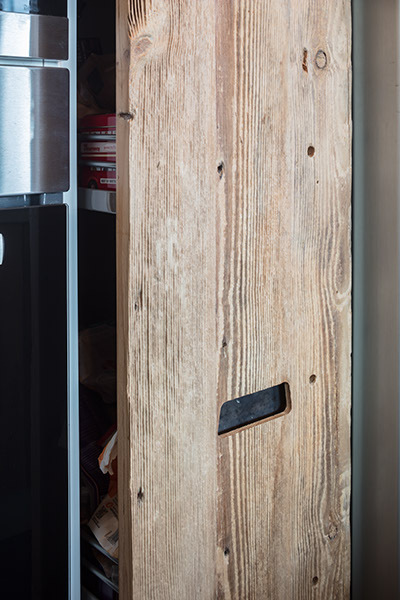 We do not make any off-the-shelf products meaning the door we make for you will be completely unique. 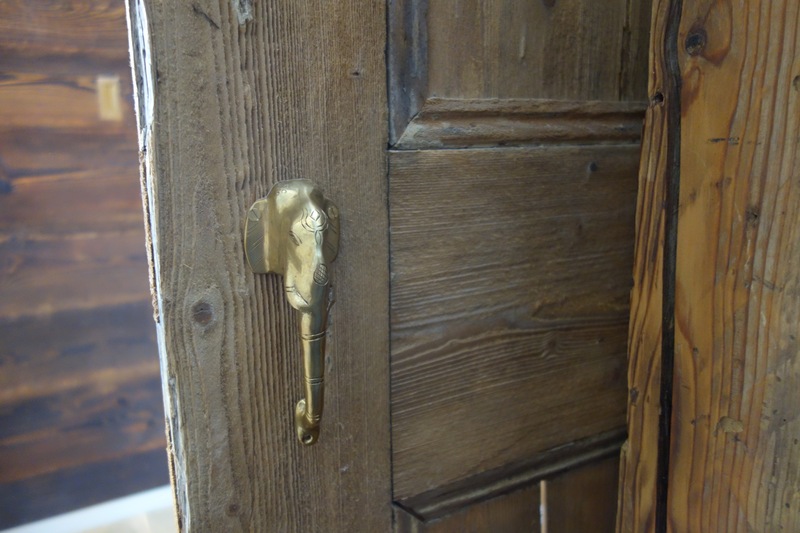 We can apply a variety of finishes to the doors, as well as supply door furniture, hardware, and installation. 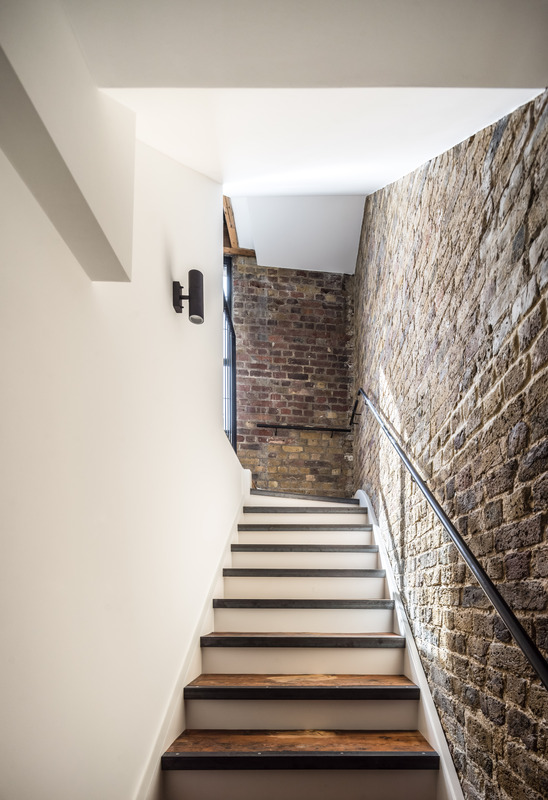 Brandler London design and craft, by hand, solid wood stairs, integrating various raw materials and lighting to create unique installations for both commercial and residential clients. 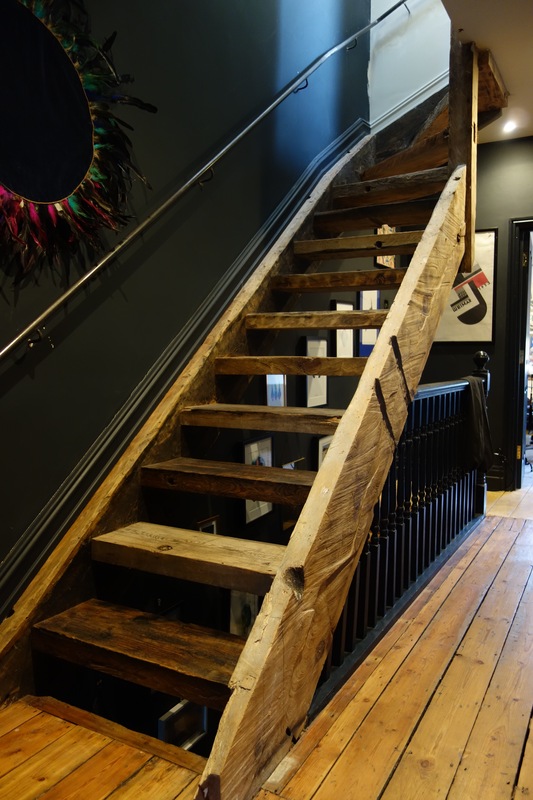 We also work directly with architects and interior designers to provide raw bespoke stair solutions with our range of rare reclaimed wood. 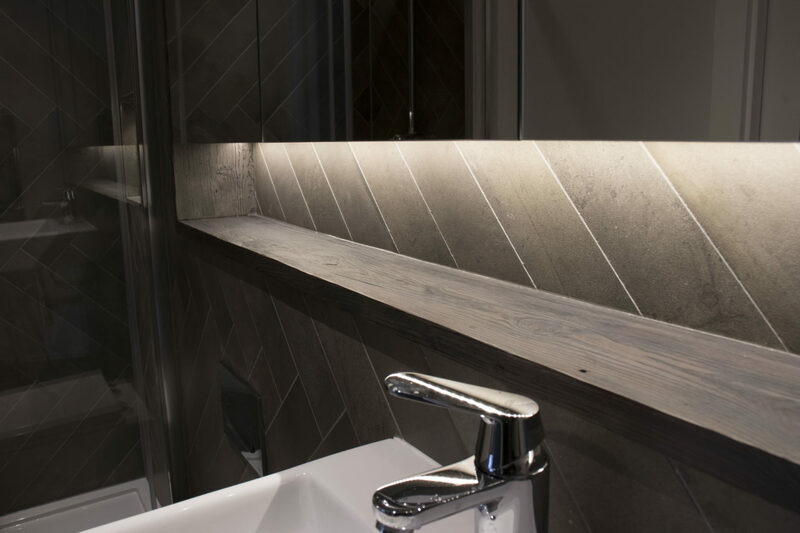 We offer these in various finishes of colour, tone, and character, with multiple fabrications options, textures, stains, and finishes. 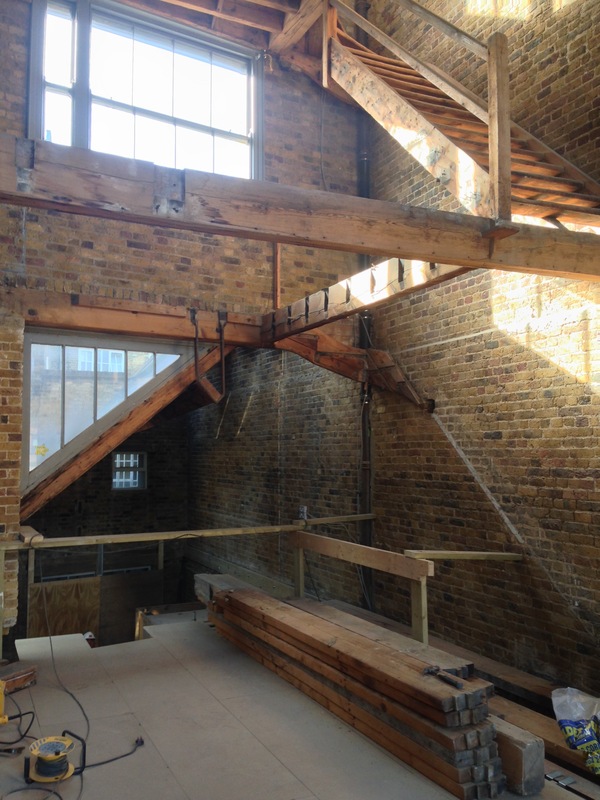 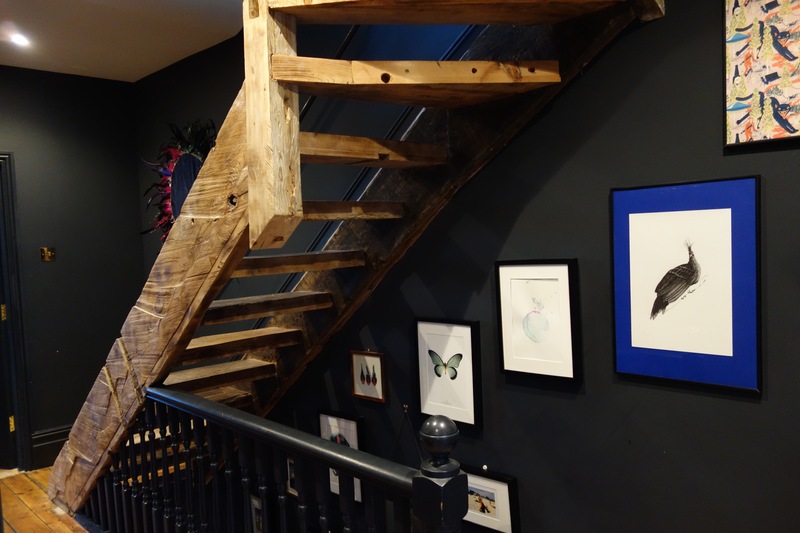 We use structural wood to construct our bespoke reclaimed wooden stairs. 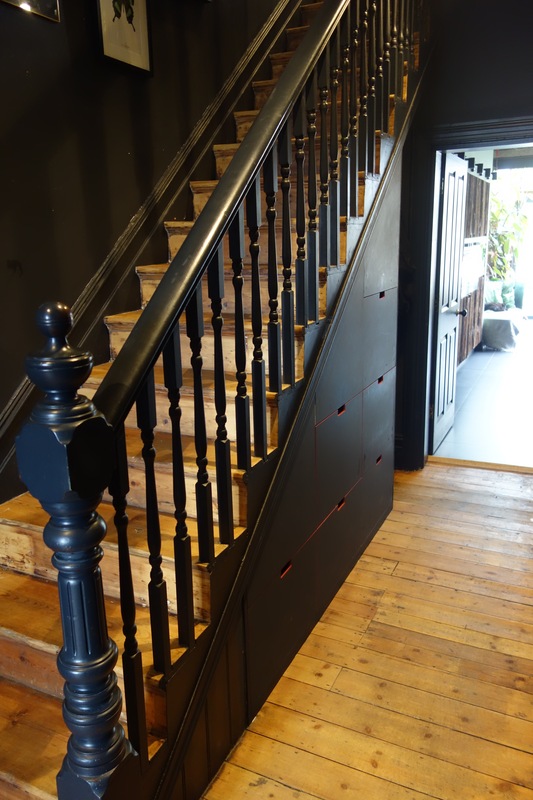 We only use structural hardwood for load bearing stair components, with larch and oak being our preferred options. 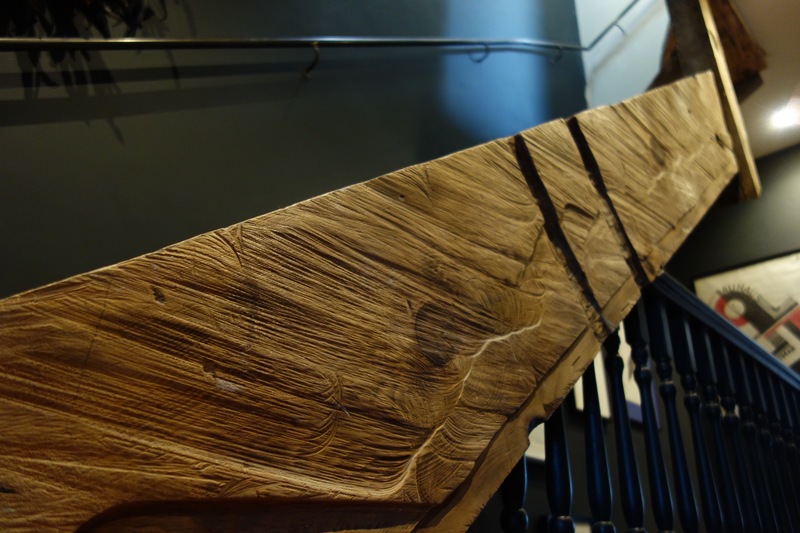 If you are looking to clad existing stairs, we also offer beautifully aged pine. 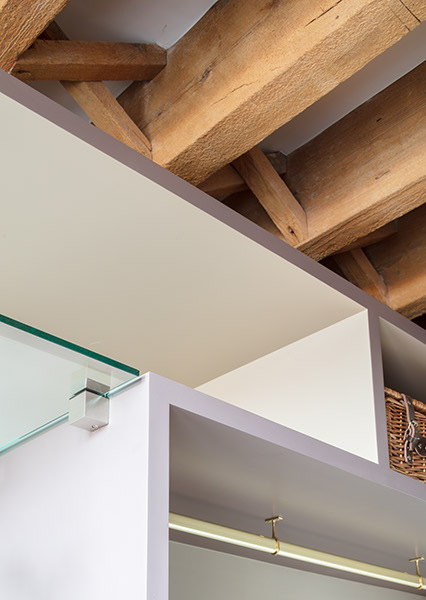 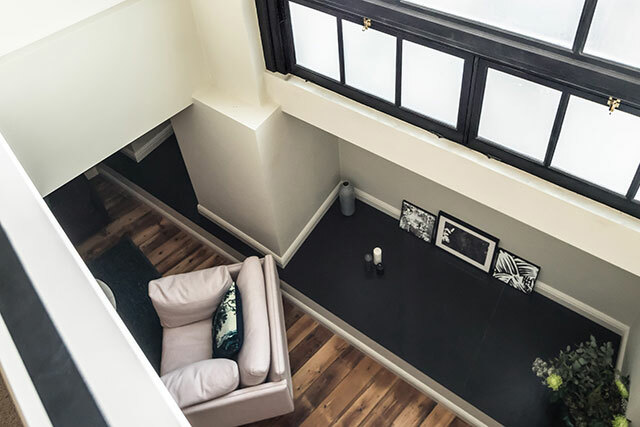 In addition to our stairs, we offer bespoke, space-saving under-stair storage options. 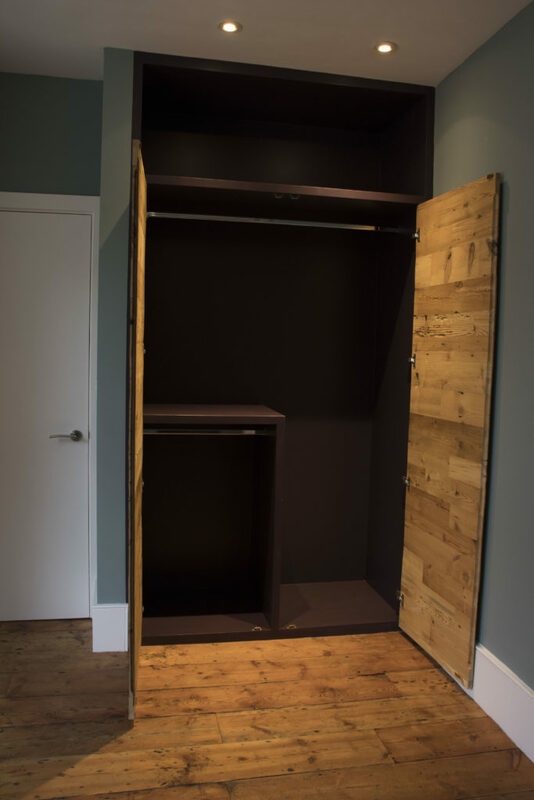 We can design and build various storage units from sliding drawers for shoes and jackets to larger cabinets. 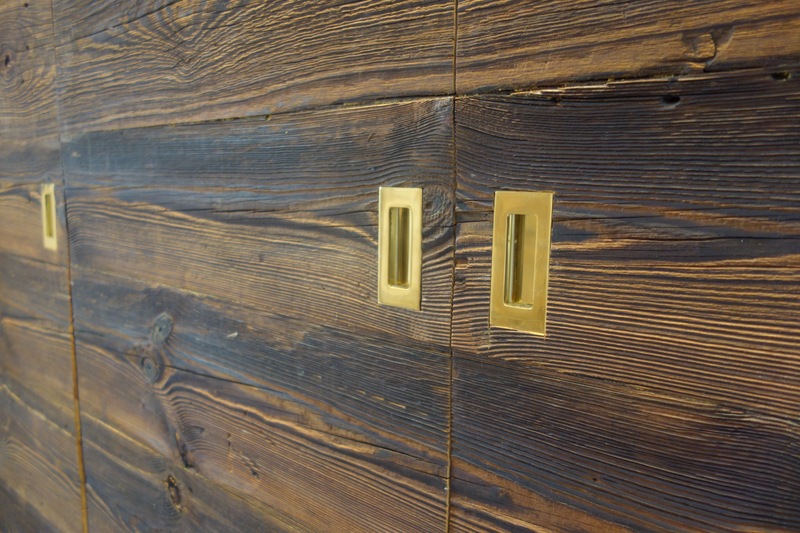 These designs are available in any of the finishes of our wood varieties or painted to blend into adjacent walls. 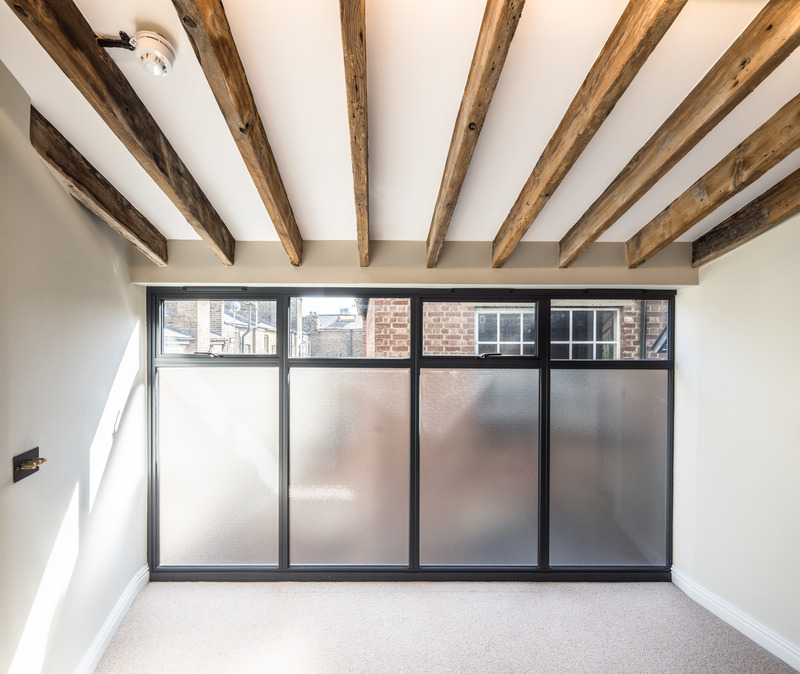 Brandler London’s extensive supplies of reclaimed wood allow us to offer a variety of aged and weathered wooden beams and joists. 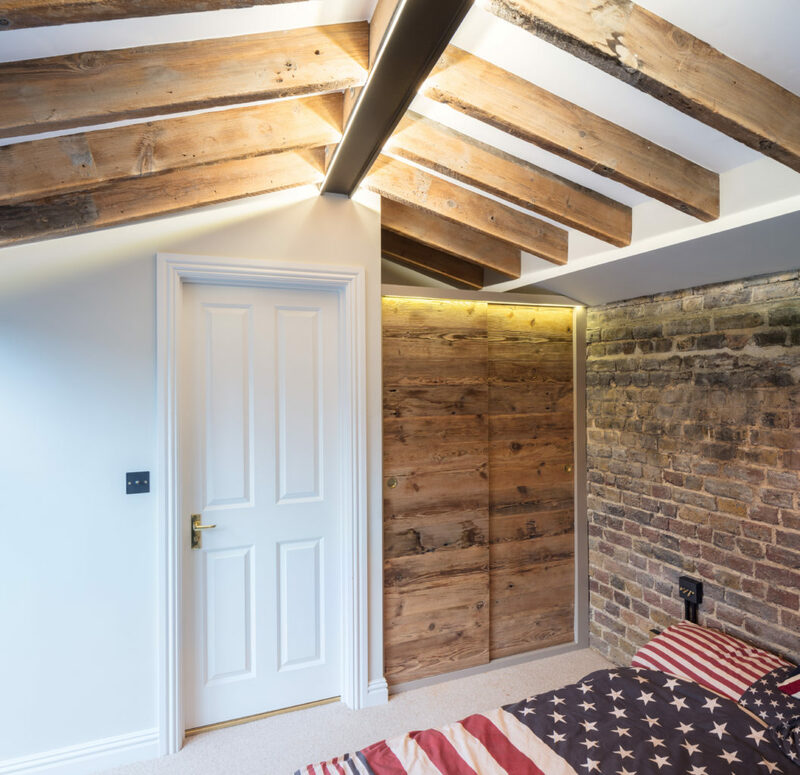 If you’re looking to add the aesthetic of textured wood beams to your space, we we can supply the necessary pieces to complete the look. 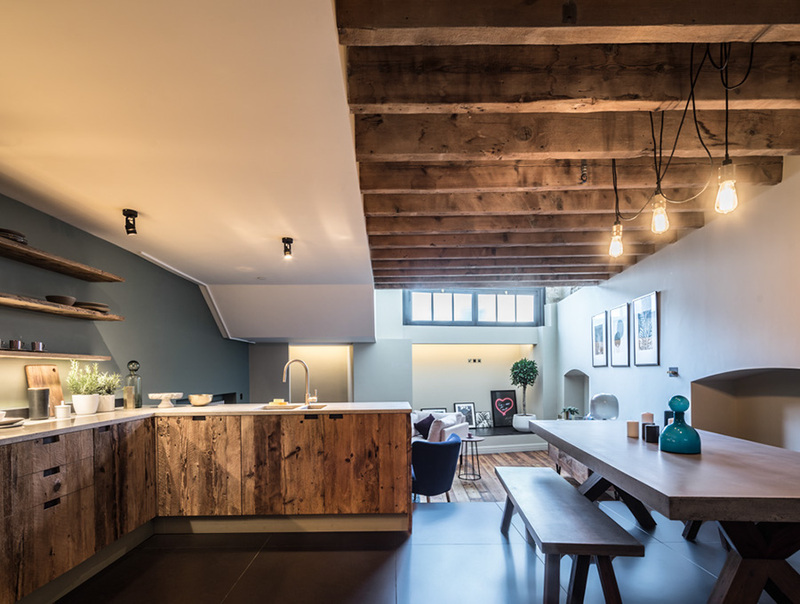 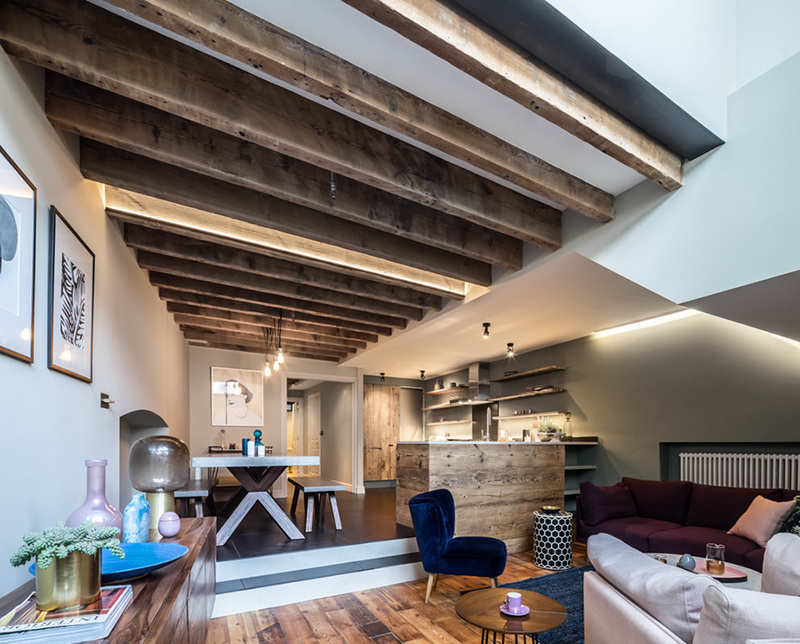 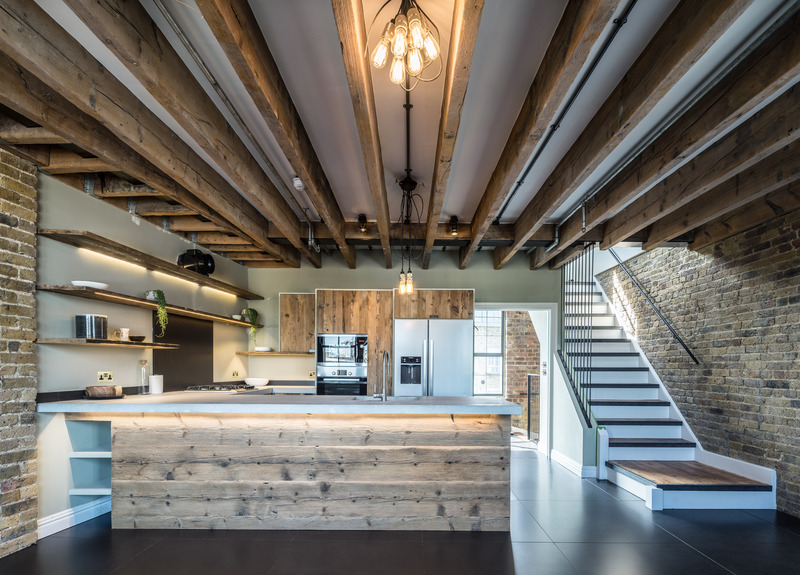 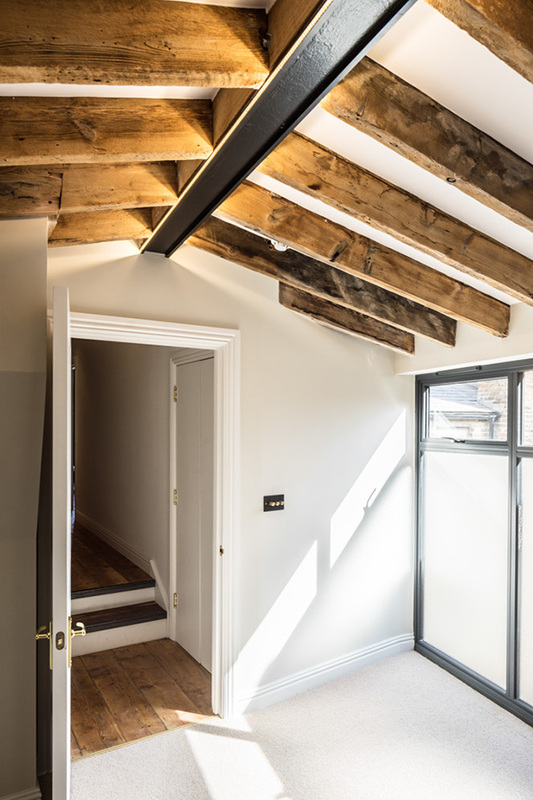 These reclaimed wood beams cannot always be used in a structural application but can be installed in non-load bearing capacities to give the appearance of timber construction to your otherwise plain space. 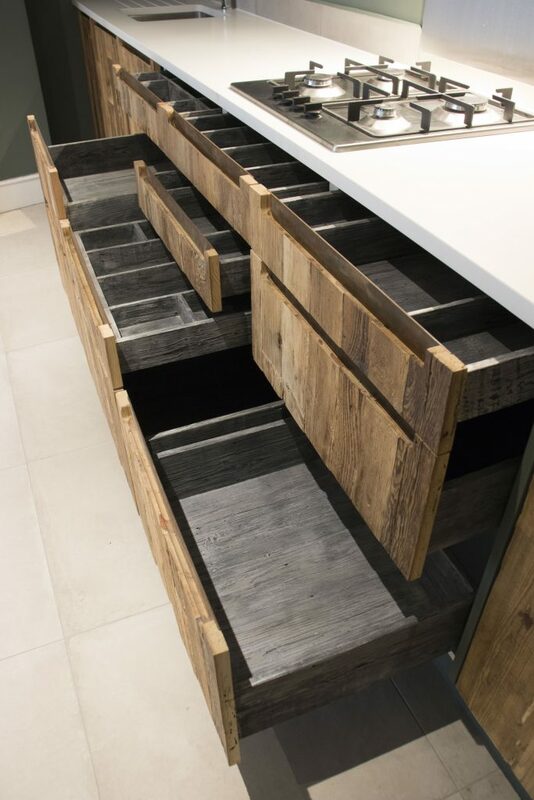 We’re always eager to work with clients who have innovative ideas in how they envision these materials to transform their space. 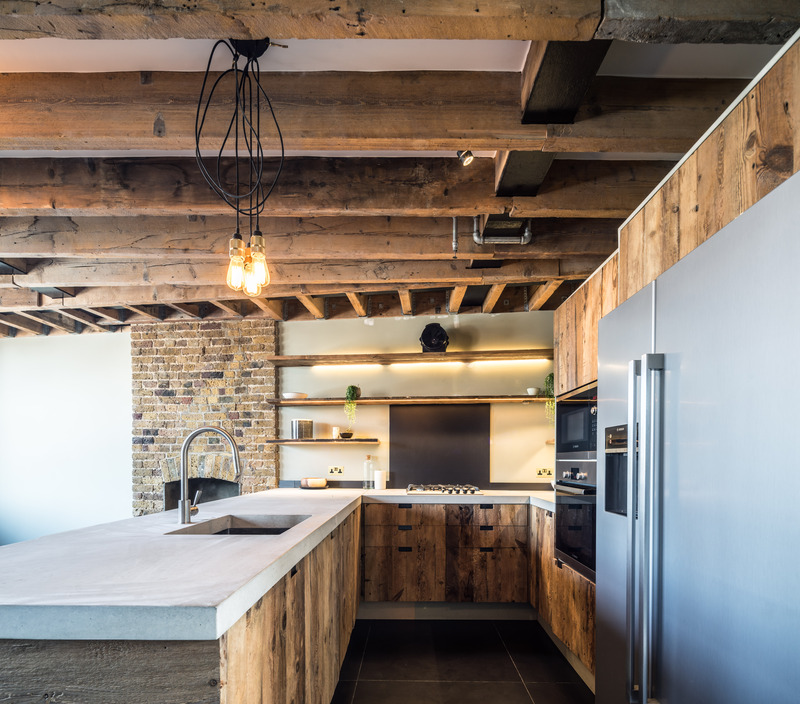 If you have an idea in need of reclaimed wood beams, contact us to discuss. 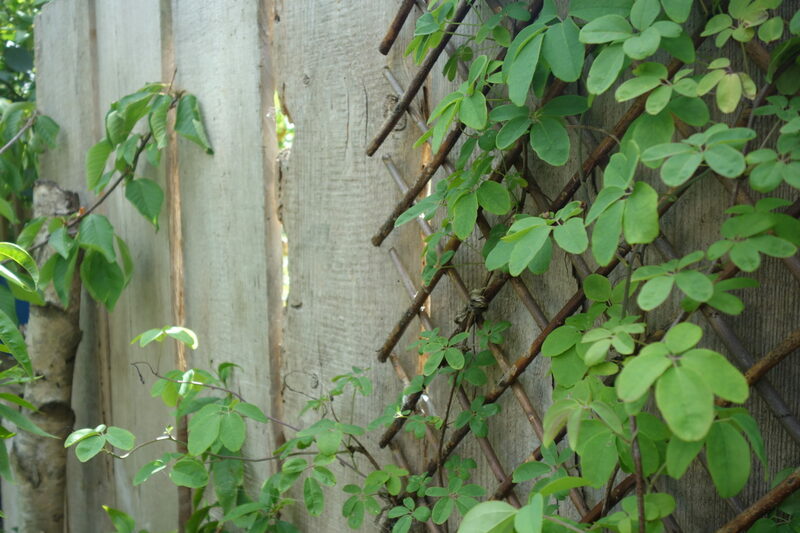 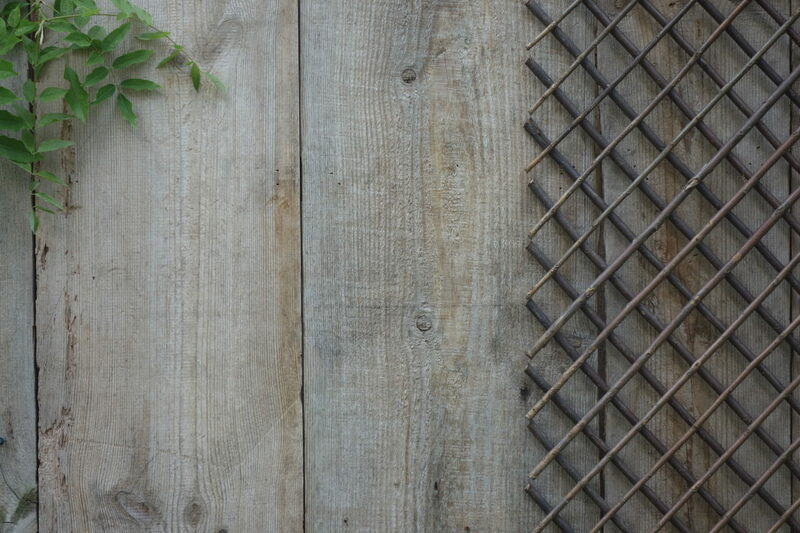 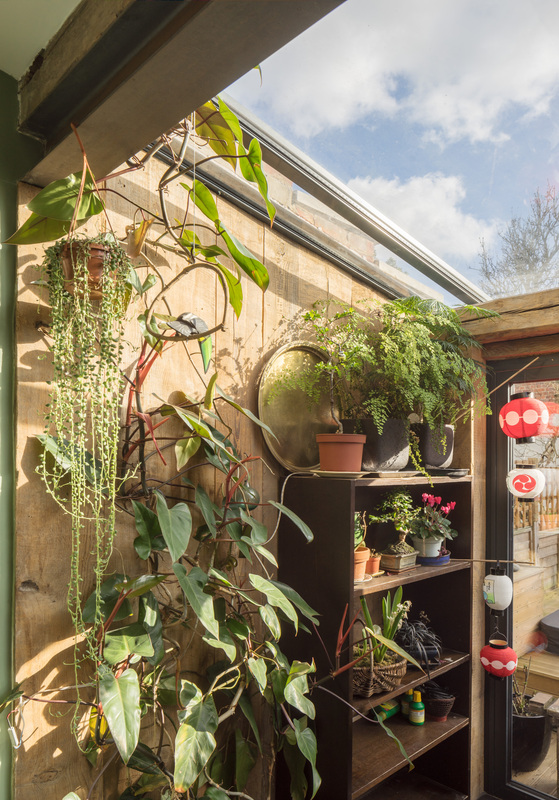 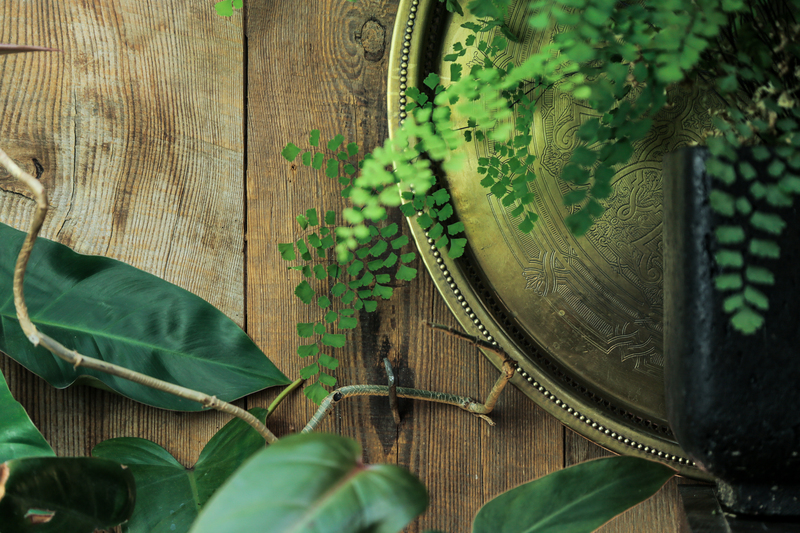 When typical garden walls need more interest, our reclaimed wood supplies are used to create cladding and bespoke features to enliven the garden space. 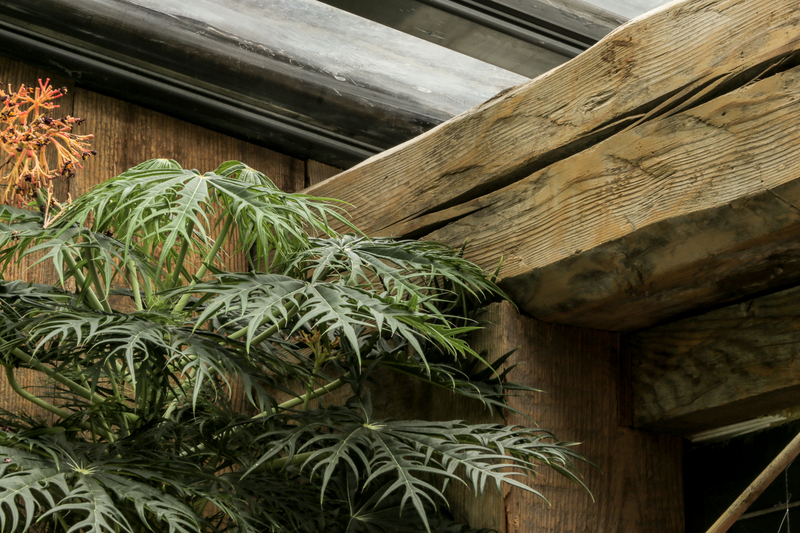 As most pieces are already suitable for outdoor use, these reclaimed wood planks used as garden cladding add warmth and texture to what would otherwise be a bare garden wall surface. 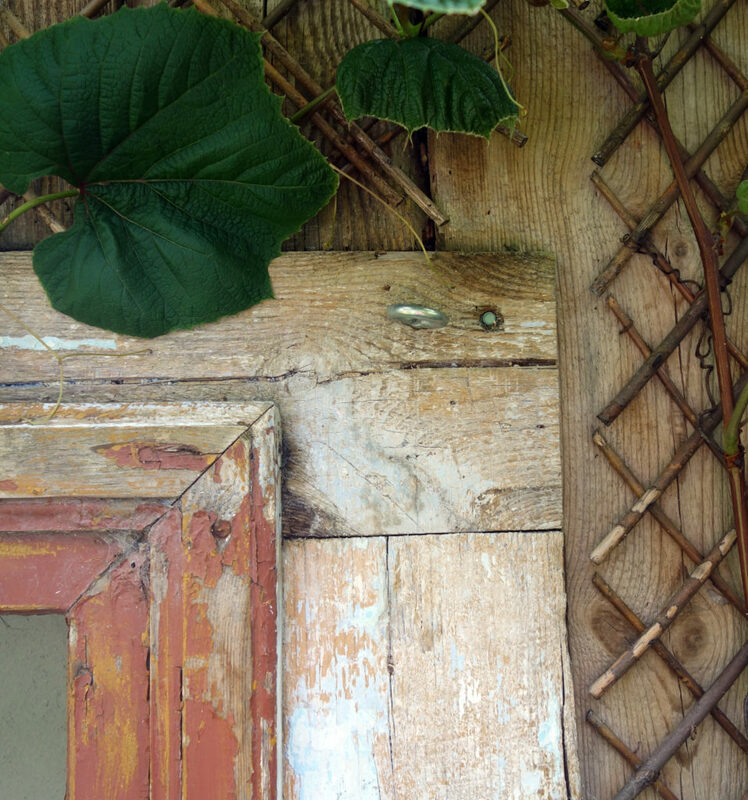 Our Barn Frames are created with particularly textured components. 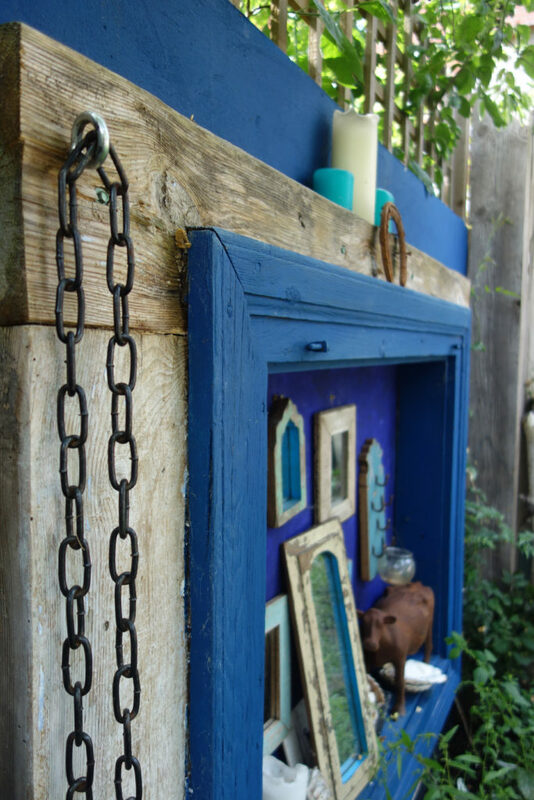 These weathered and character-filled focal points tie an outdoor space together with the same effect as your interior framed art or gallery wall. 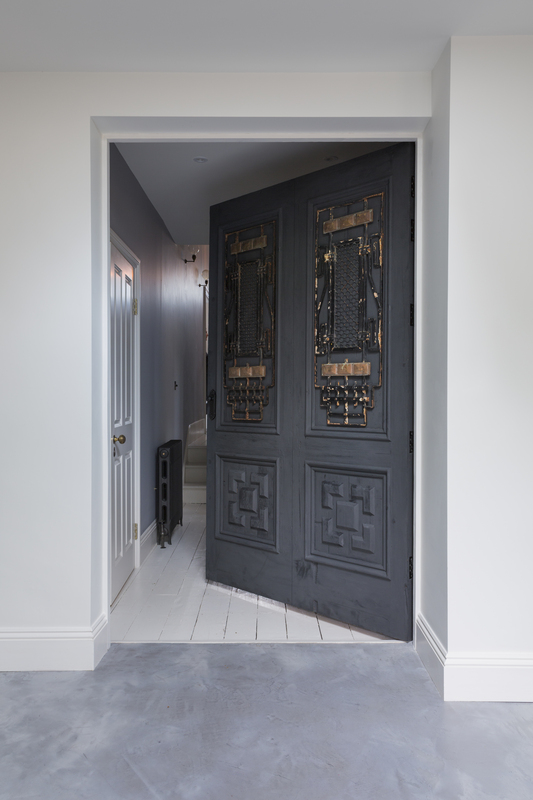 Brandler London was commissioned to design and construct this colossal door for the fabulous Siouxsie Dickens, a freelance fashion stylist who designed the amazing Photographic Location House, Kempshott Road. 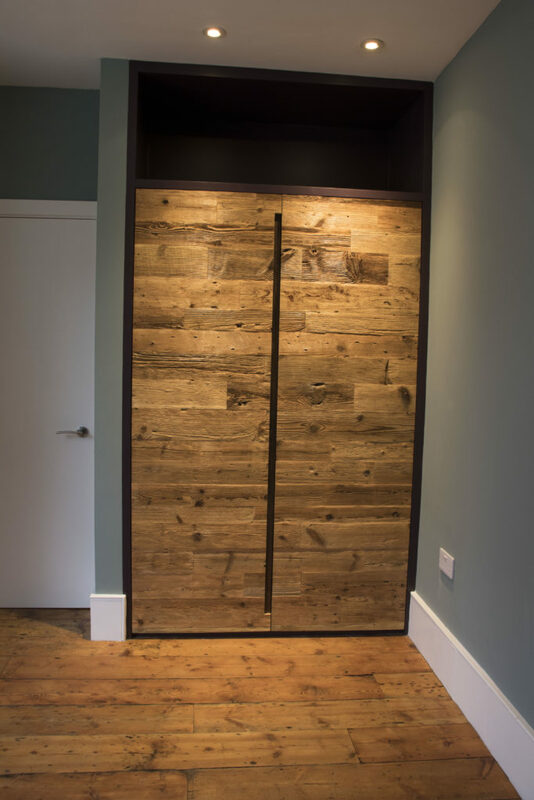 Made from reclaimed larch and painted black, these “doors” were designed to appear as two doors while actually being just one beast of a door. 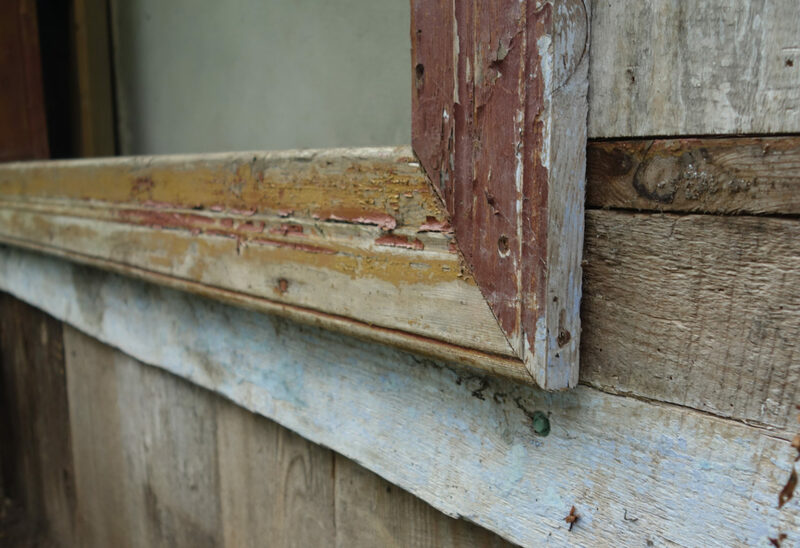 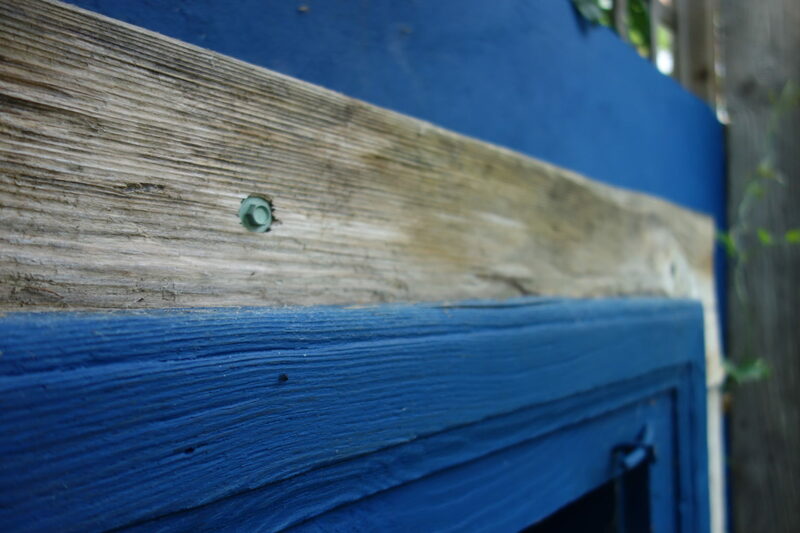 The painted surface still maintains the rich character of its 150 year old reclaimed material, with still visible dowel and nail holes, cracks, weathering and grain. 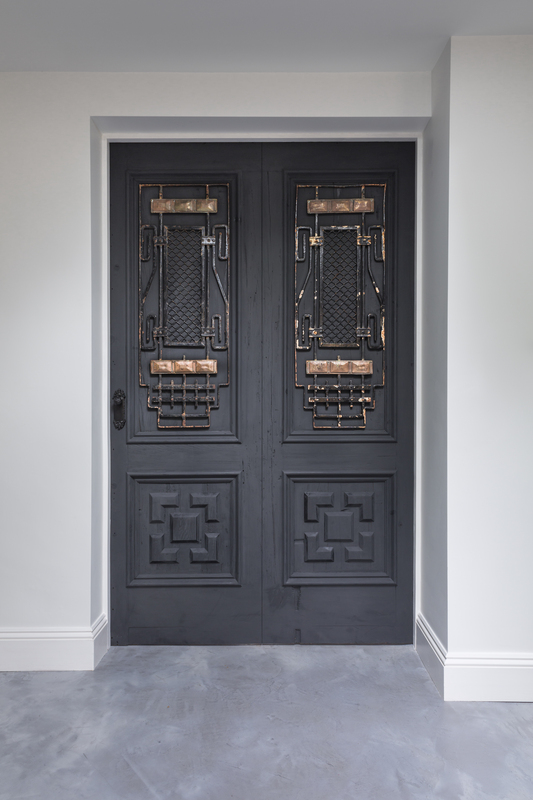 The two different styles on each side of the door give additional depth and character. 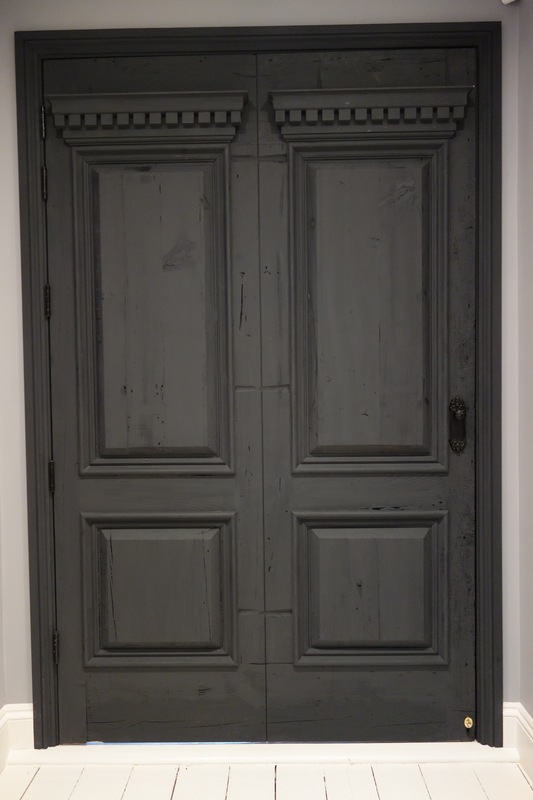 This door is fire-rated FD6 with smoke seals.